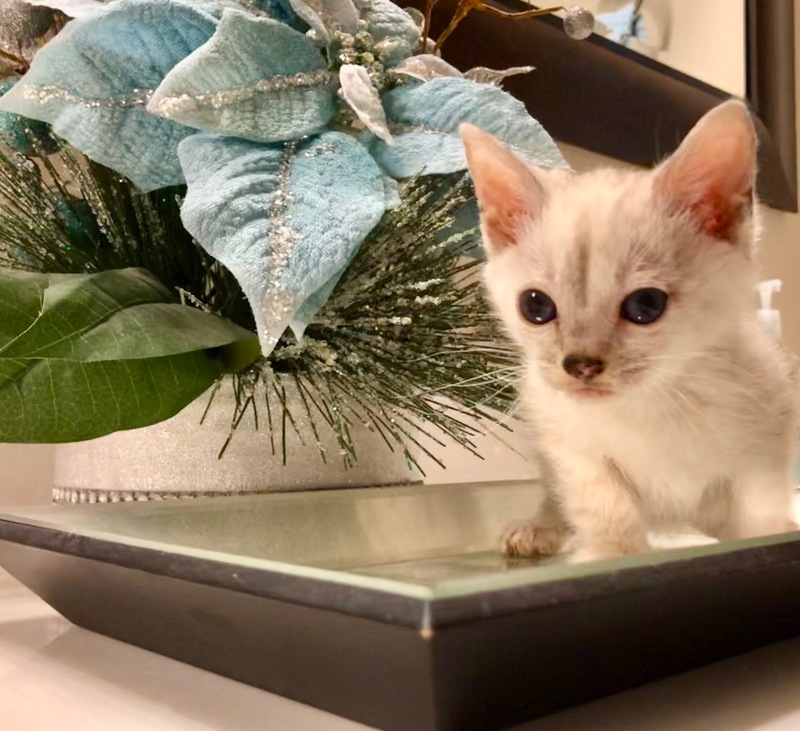 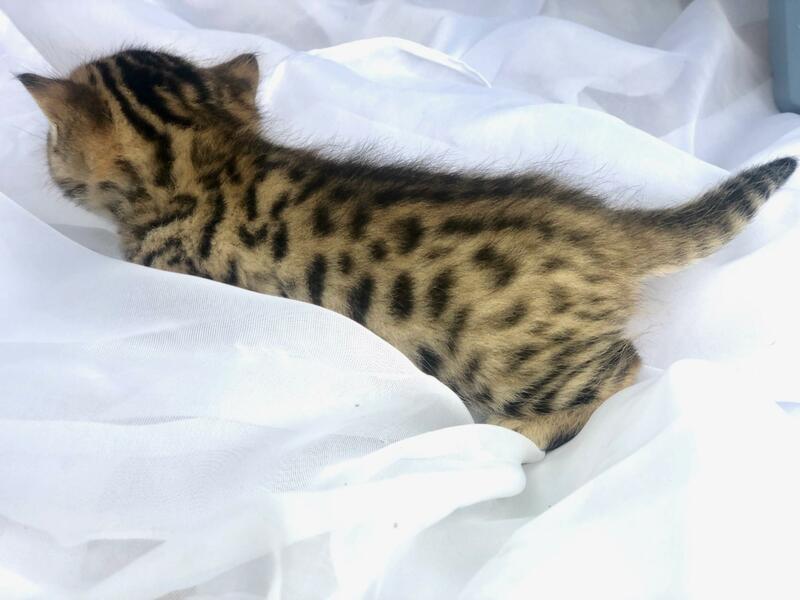 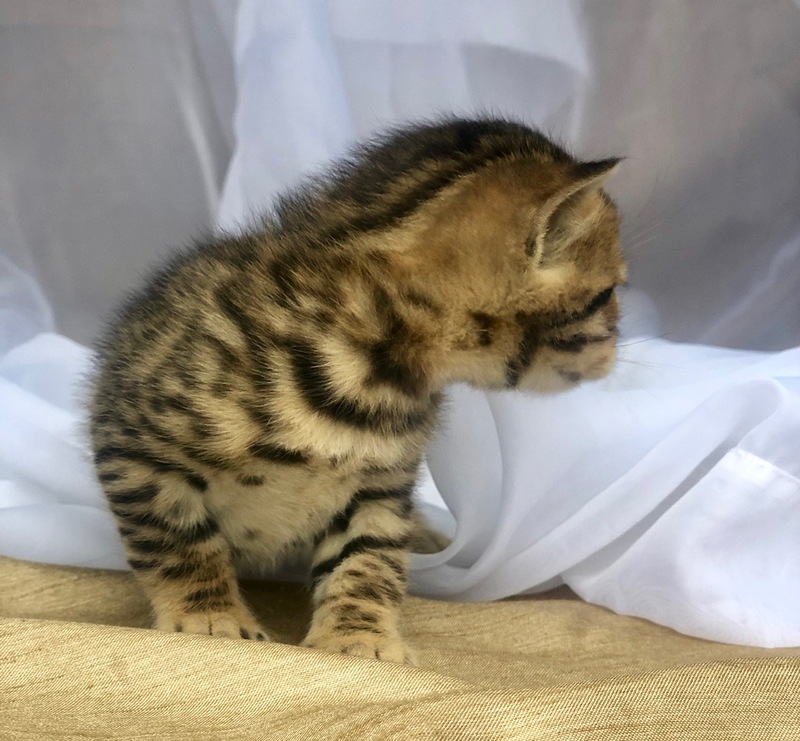 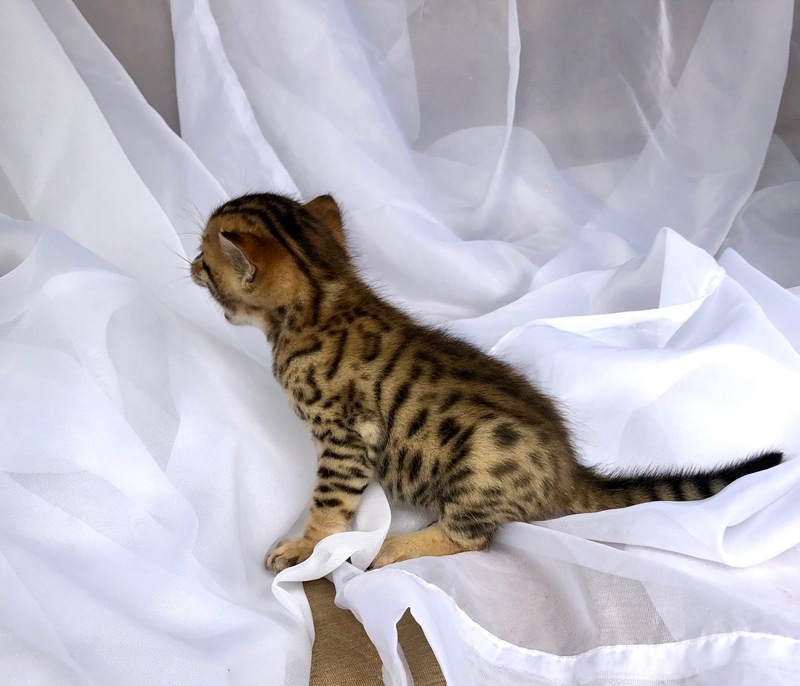 Thank You for Viewing Our Bengal & Savannah Babies! 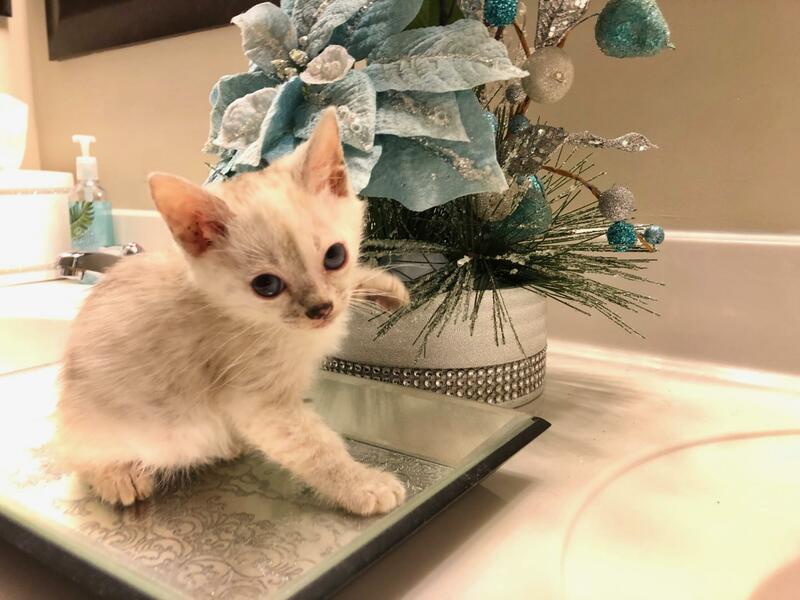 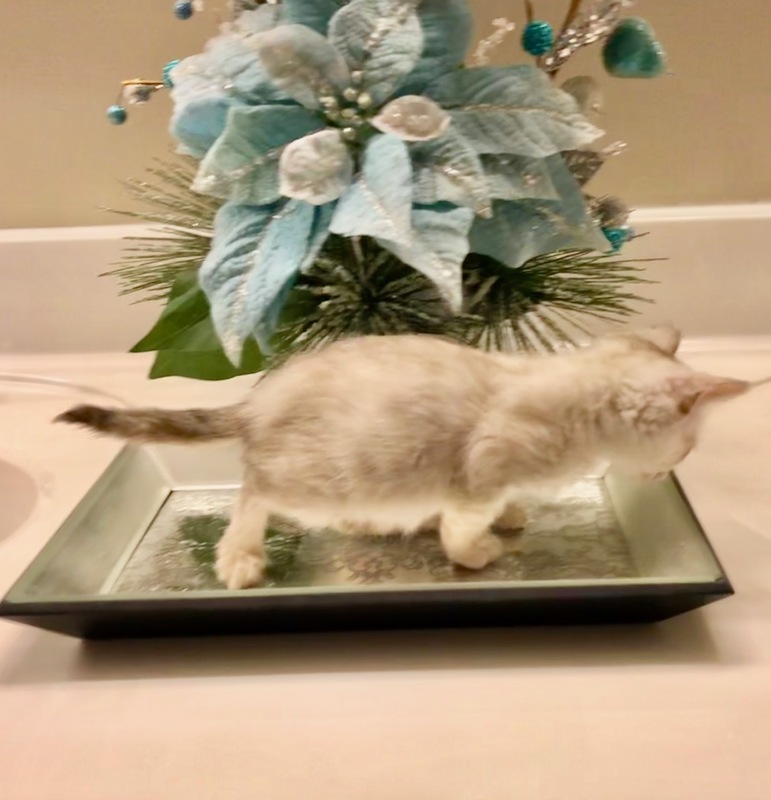 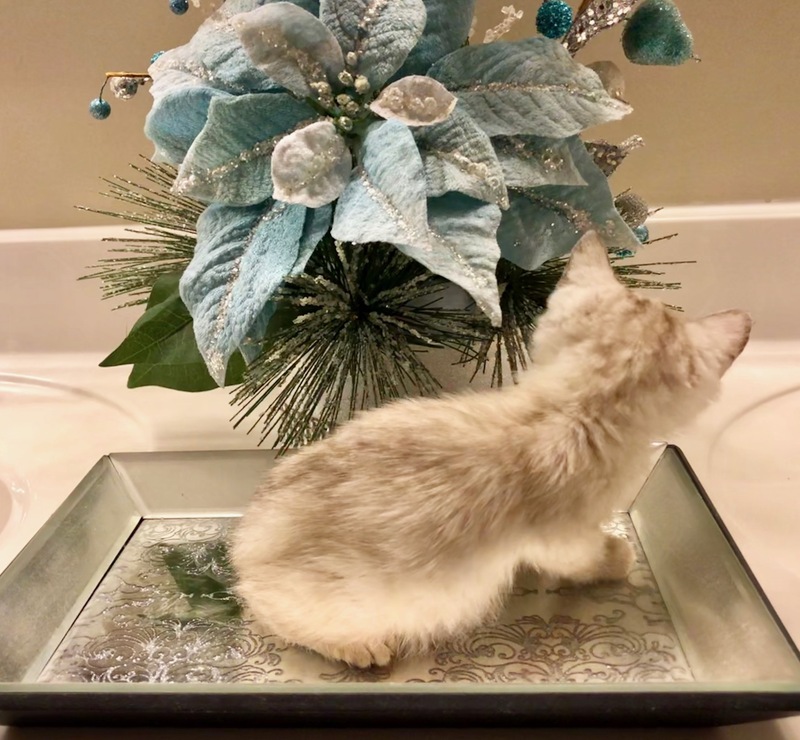 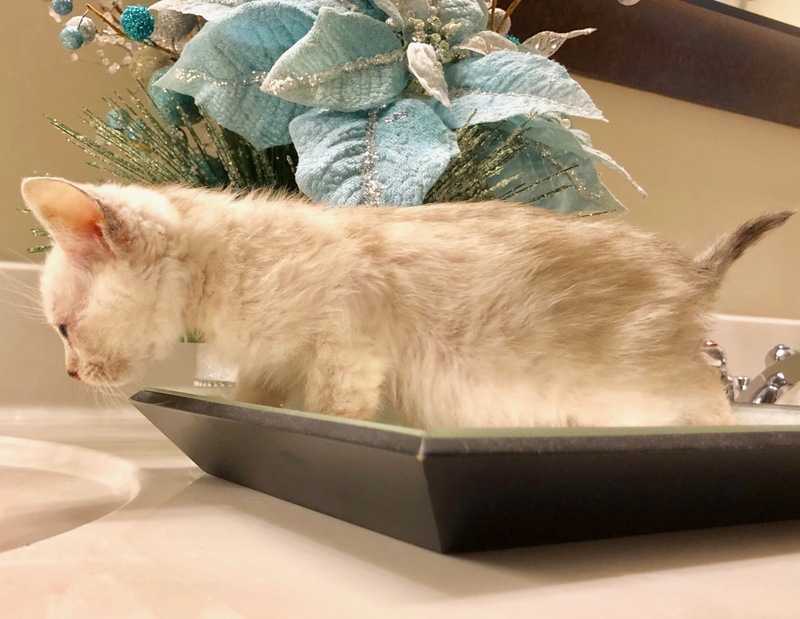 "Bunny" Seal (spotted) Lynx Point Female- Bunny is the runt of her litter but she makes up for her smaller size in her giant purr! 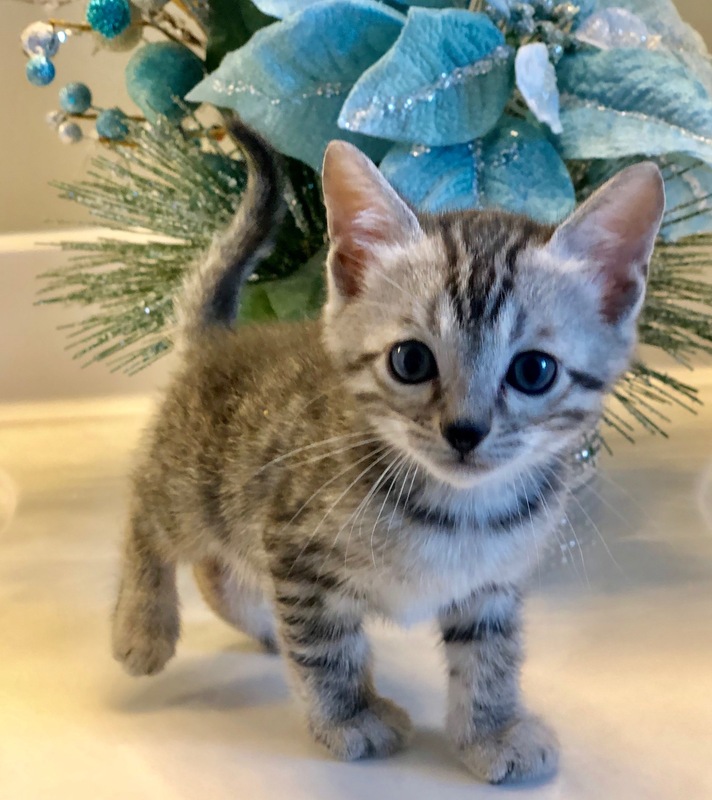 She is a love bug and will make a wonderful family pet. 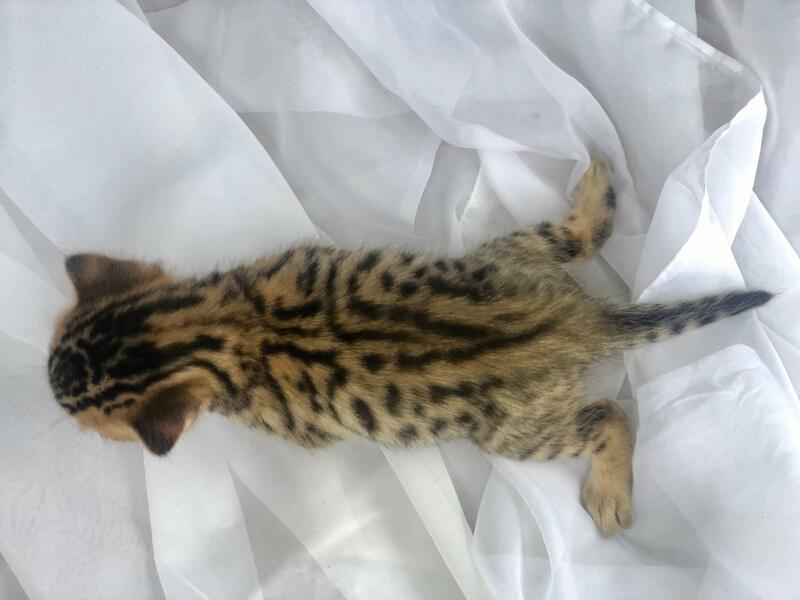 Her spots with develop as she matures. 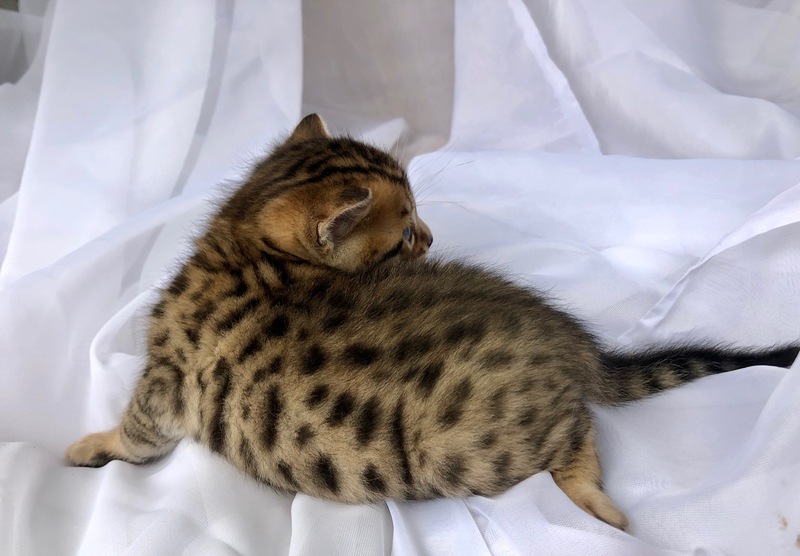 Rahimi Bengals by 6 months of age. 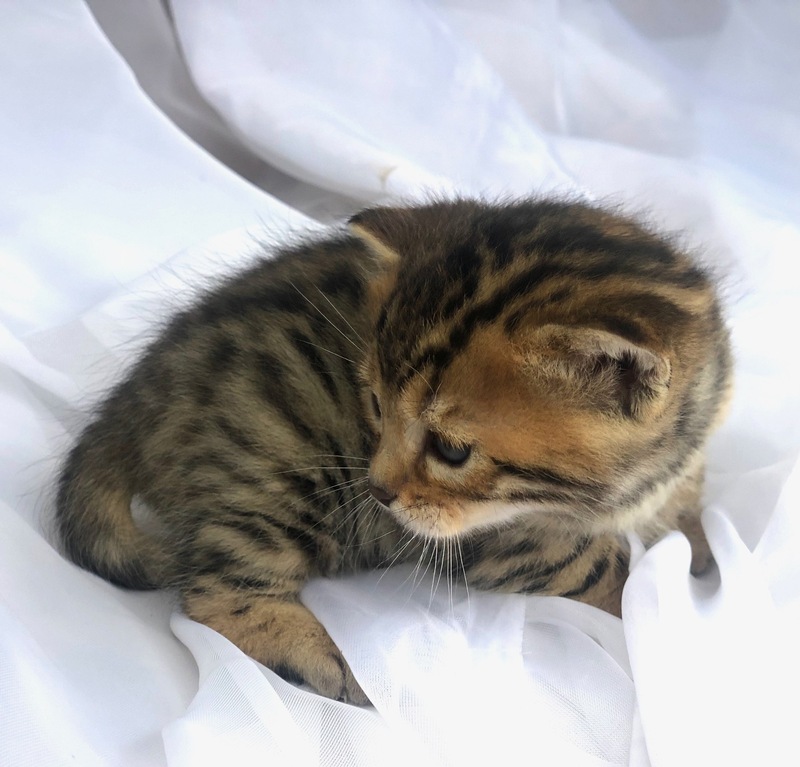 Visit our Past Kittens page to view previous cubs. 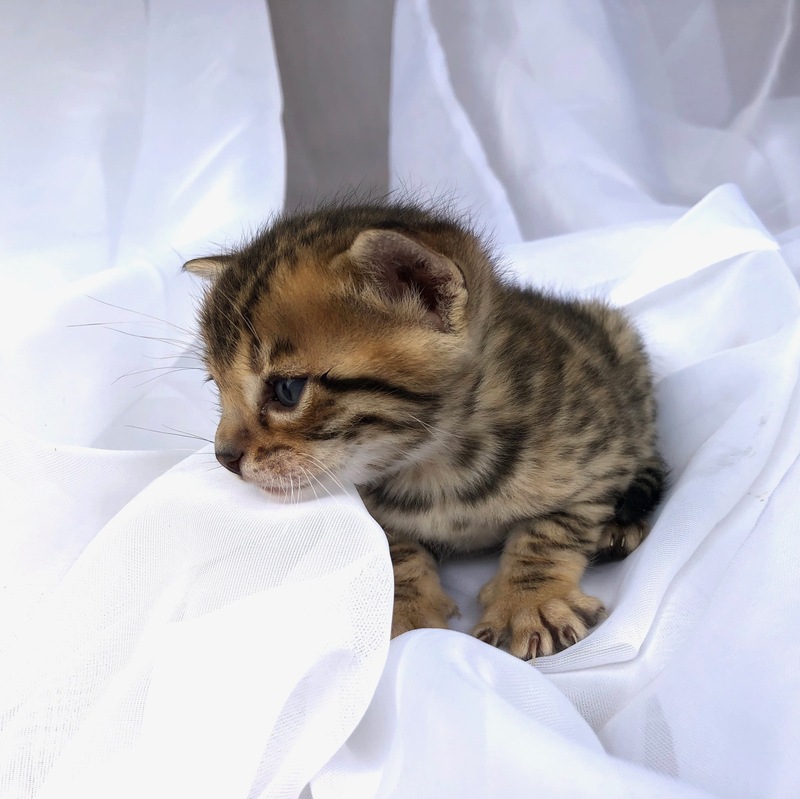 A $200.00 non-refundable deposit holds your litter-pick. 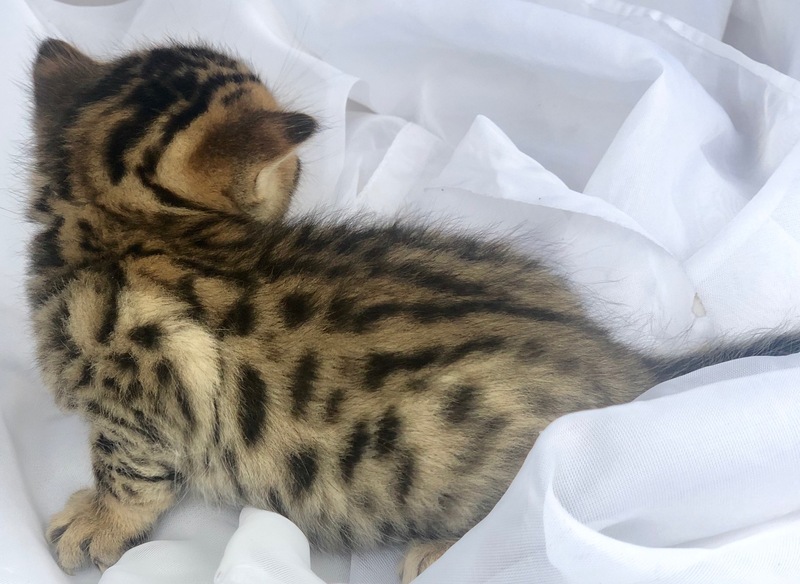 Litter pick reservations will be given in the order the deposits are received. 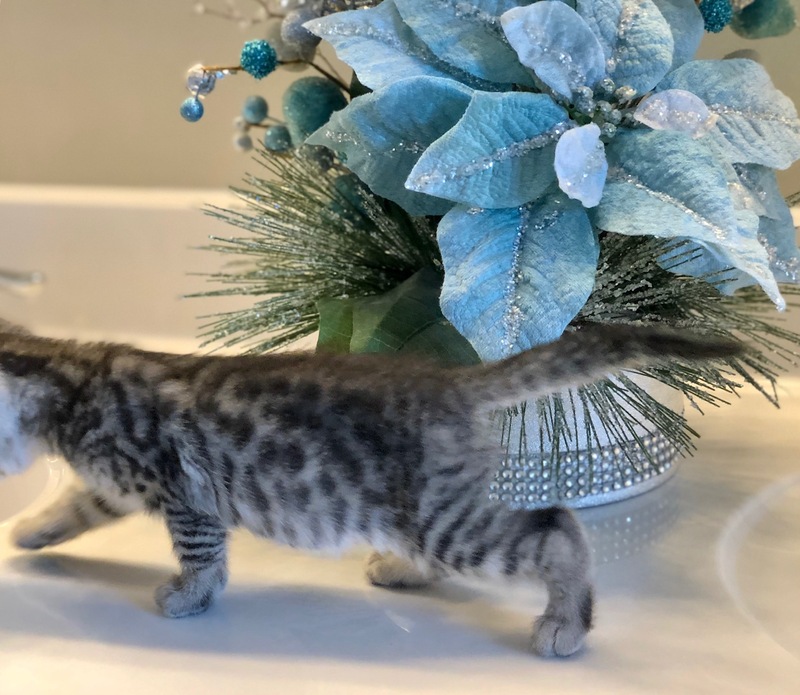 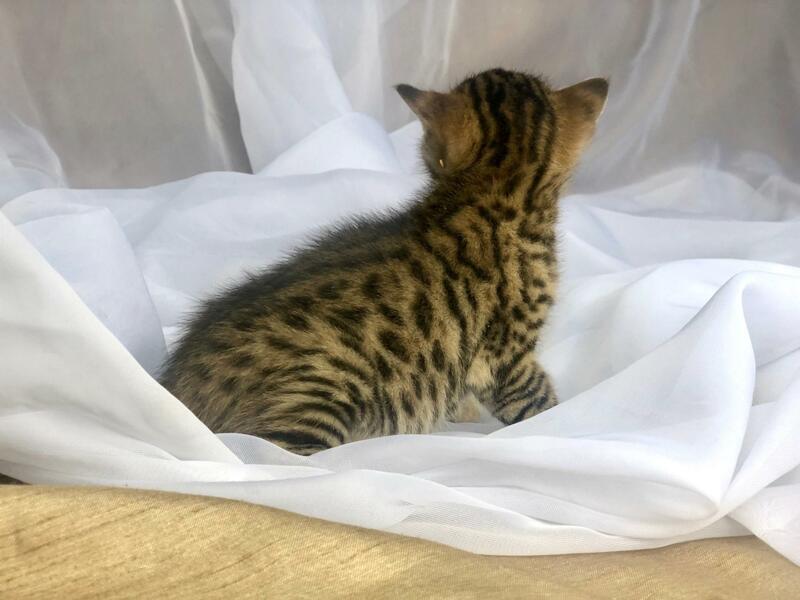 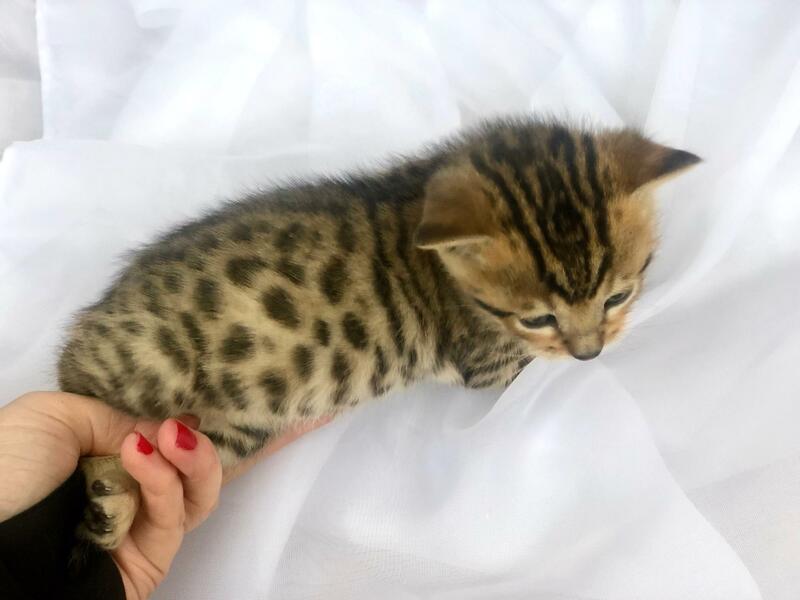 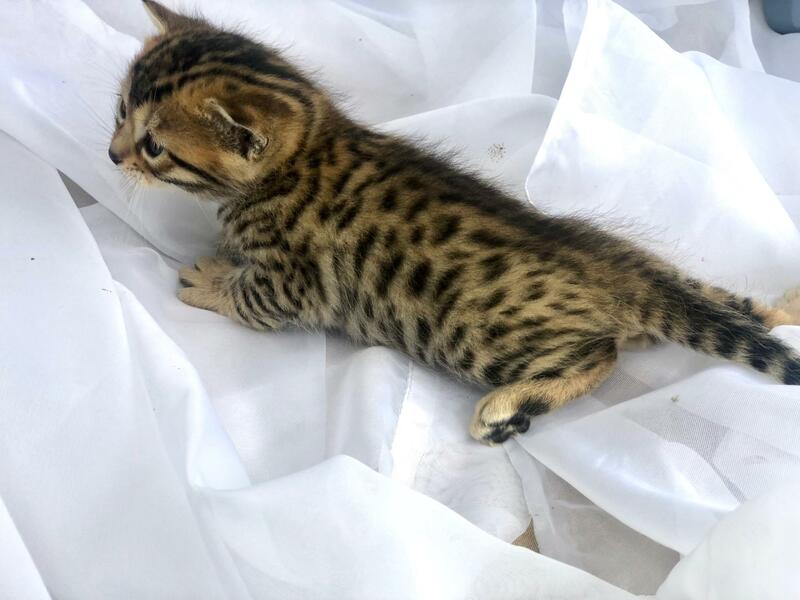 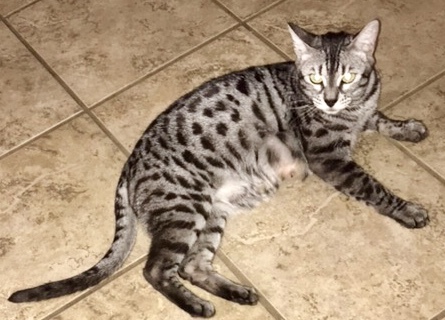 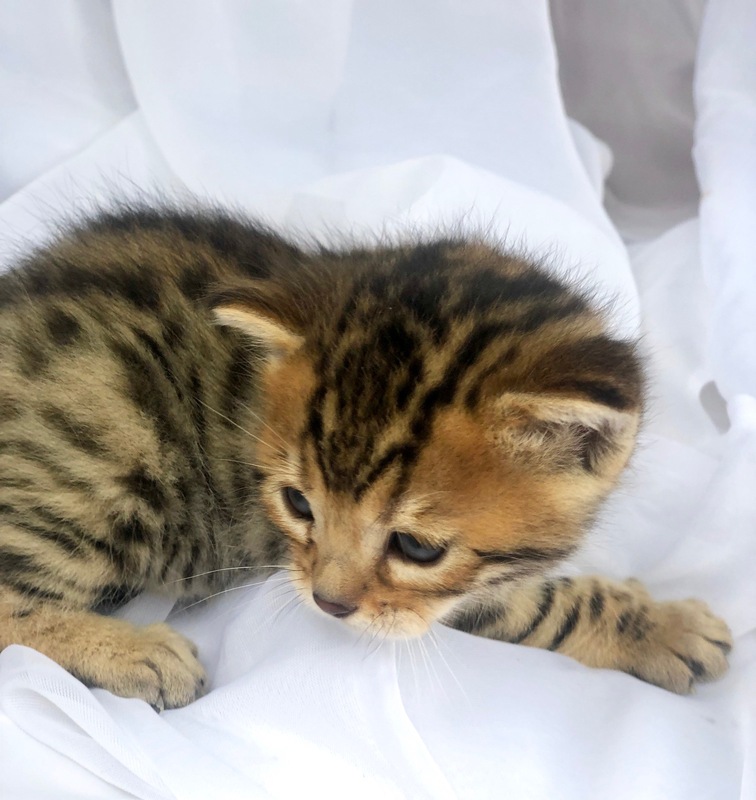 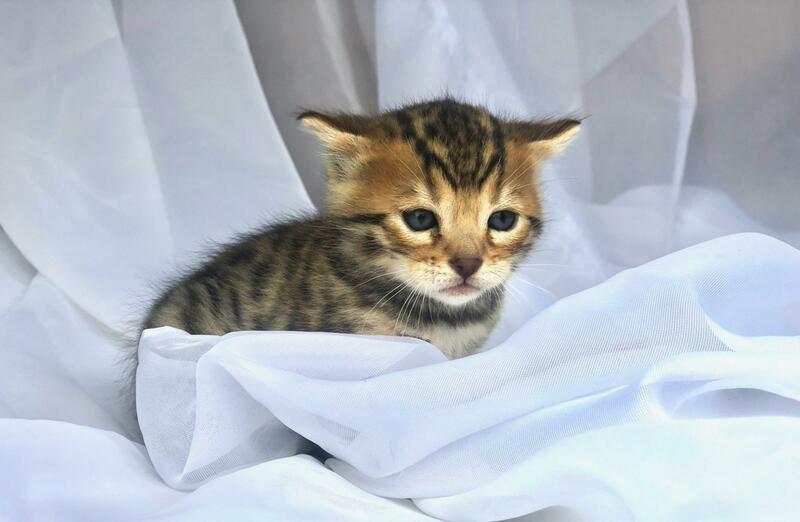 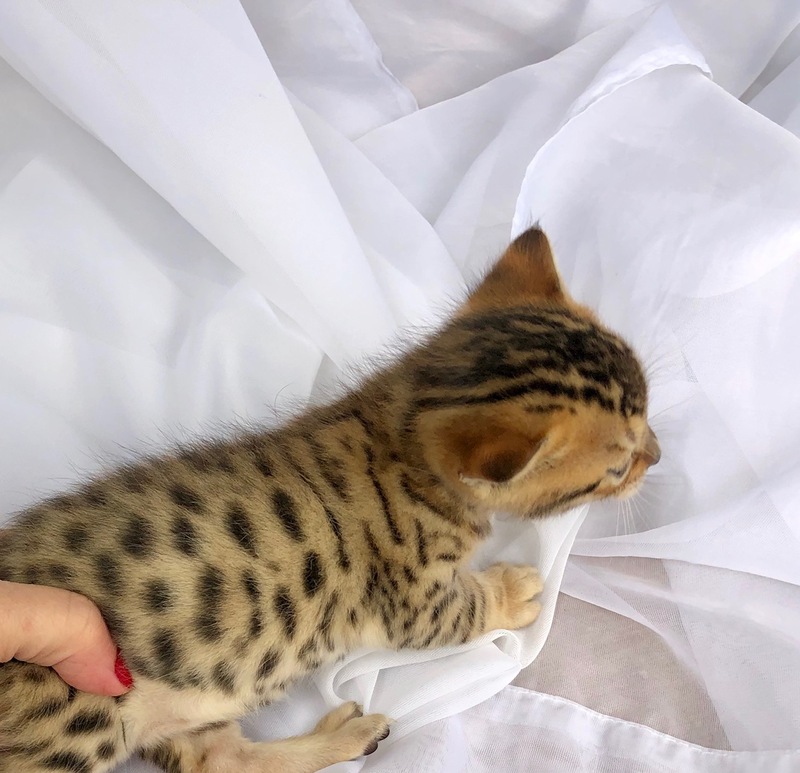 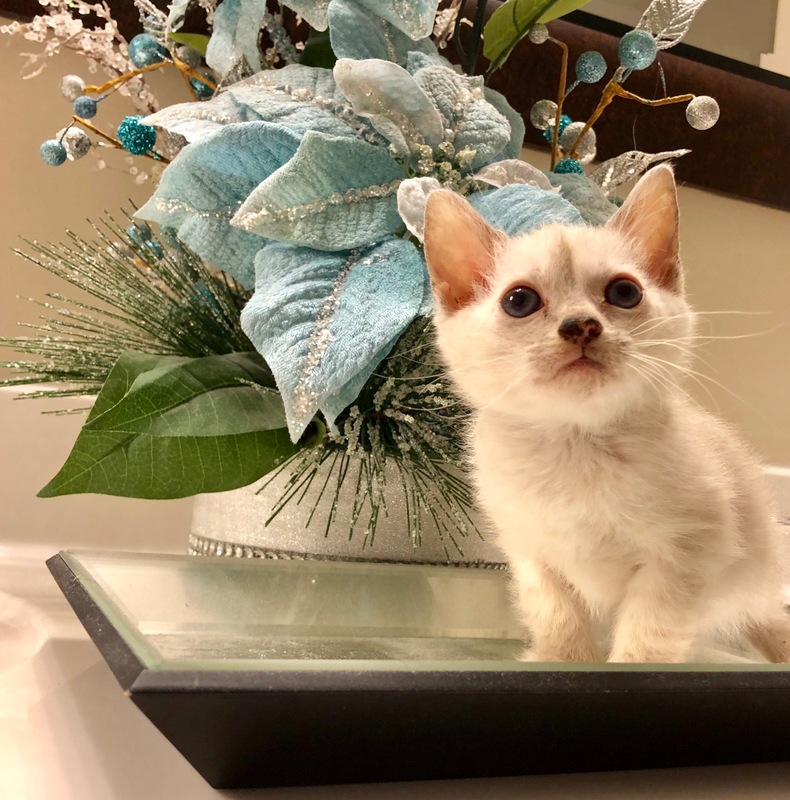 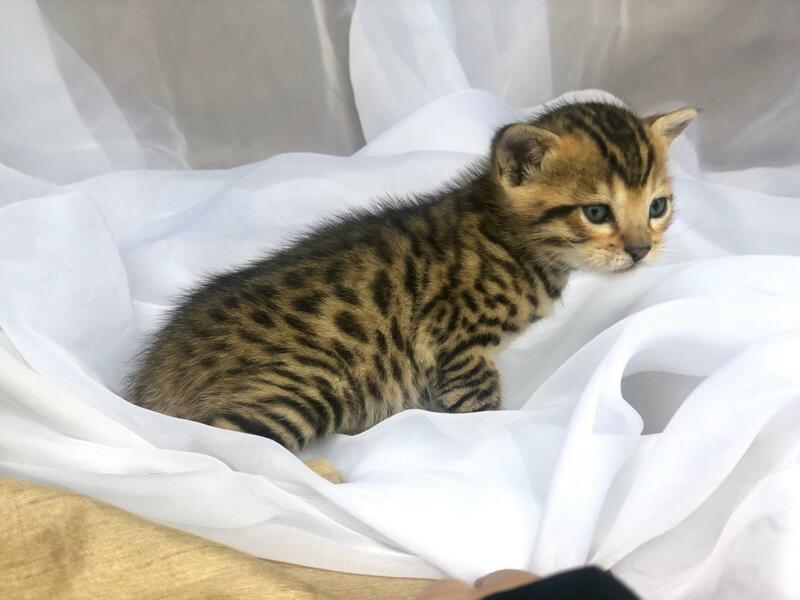 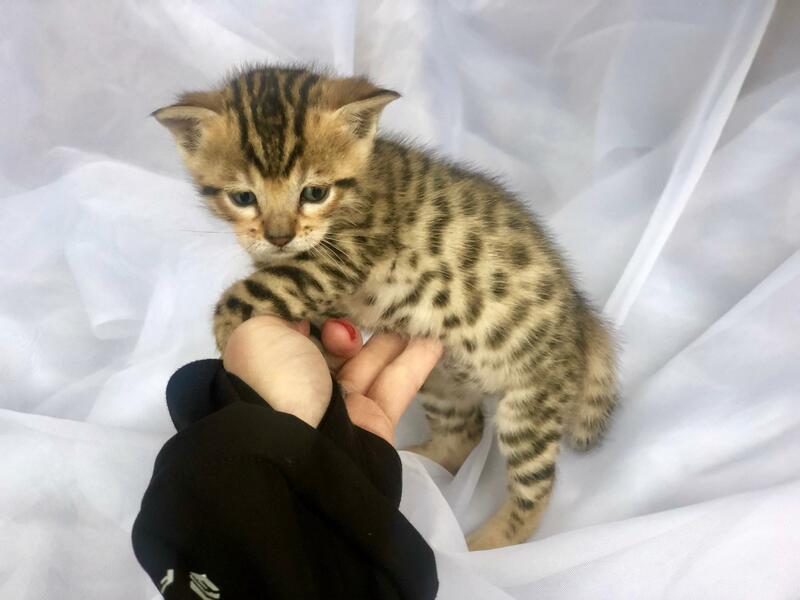 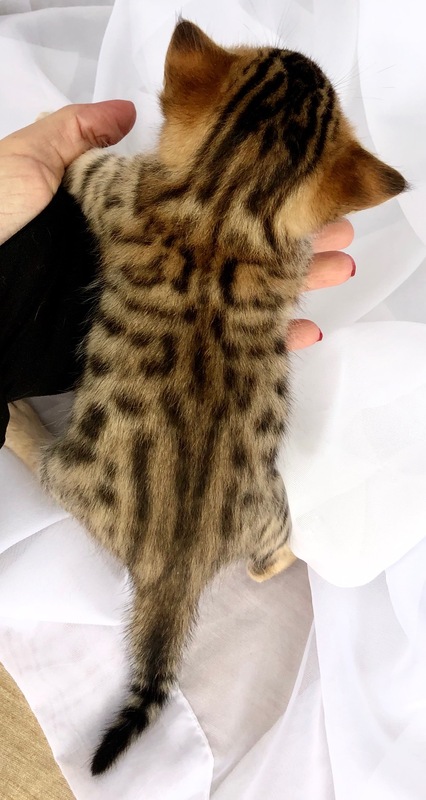 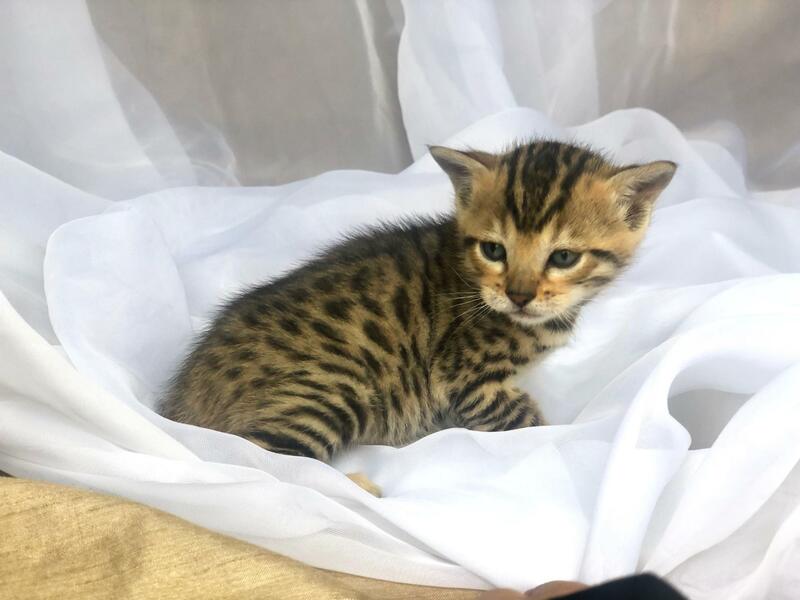 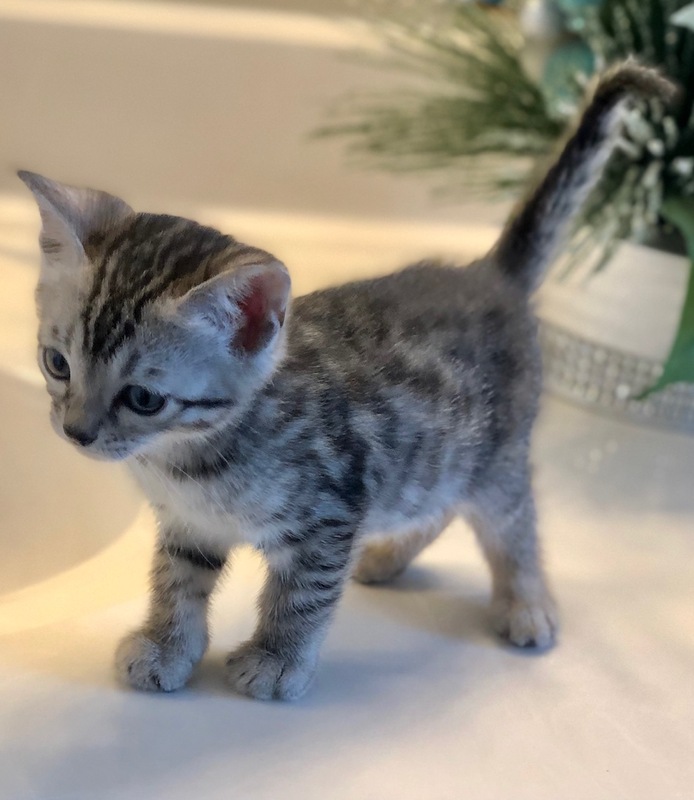 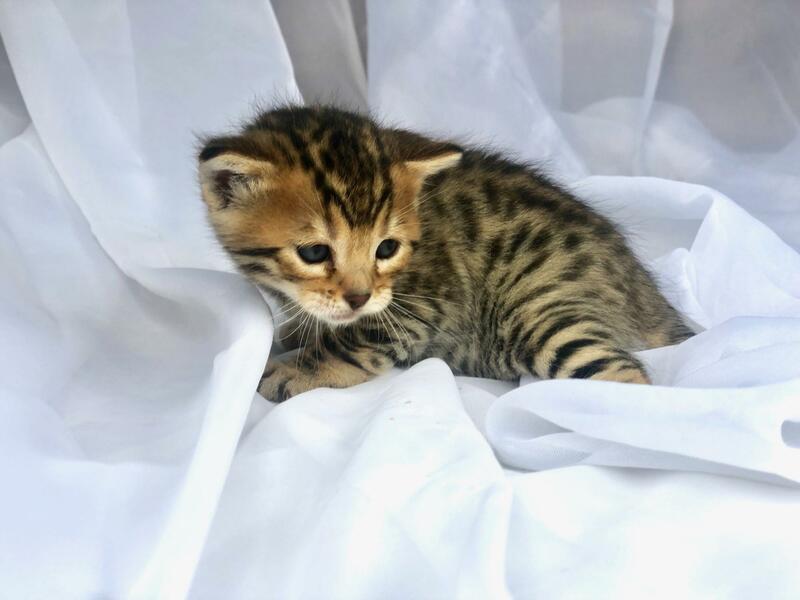 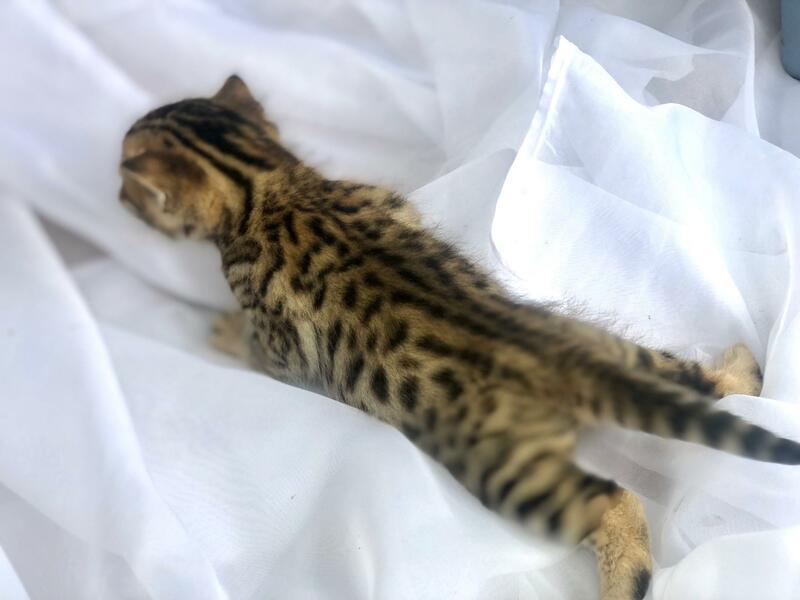 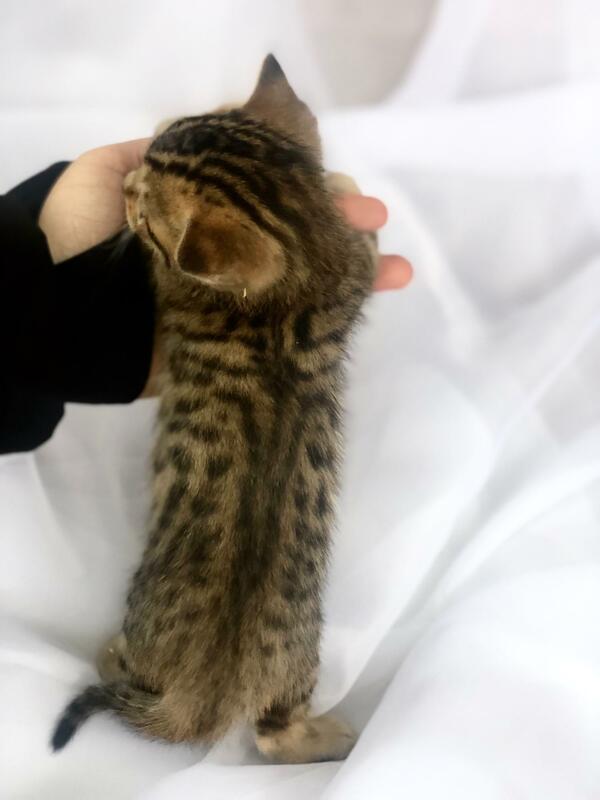 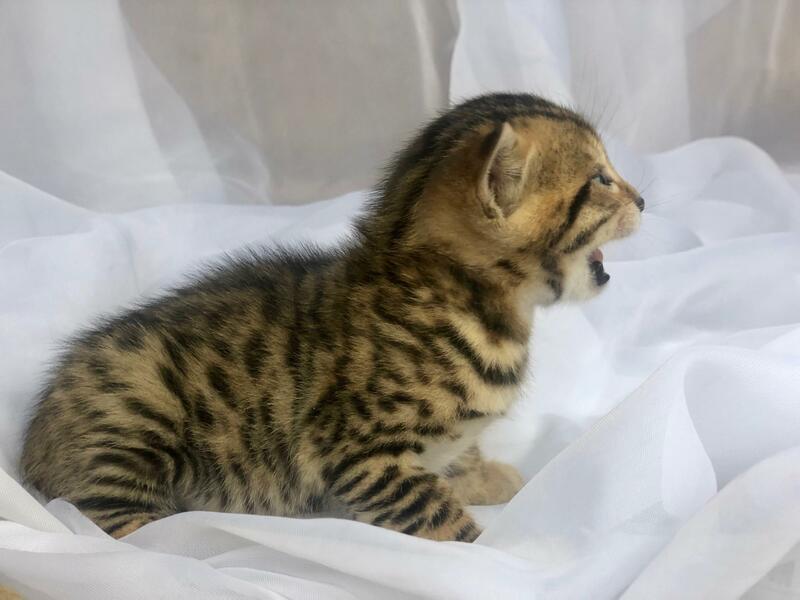 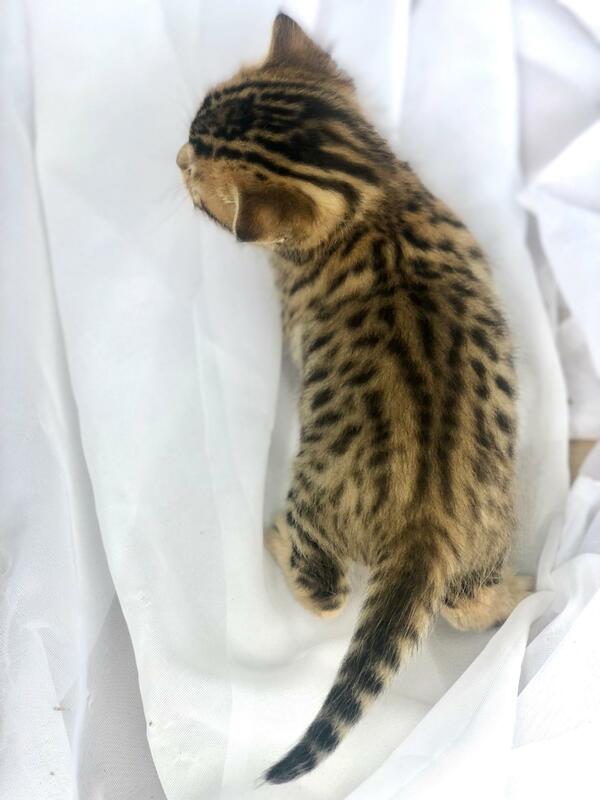 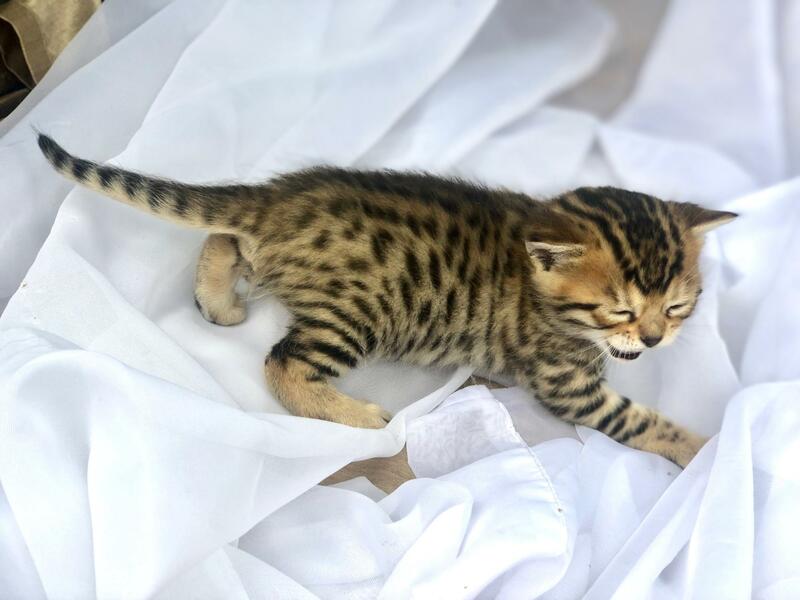 Buyer must be 18 years or older or be accompanied by a parent to adopt a Rahimi Bengal or Savannah. 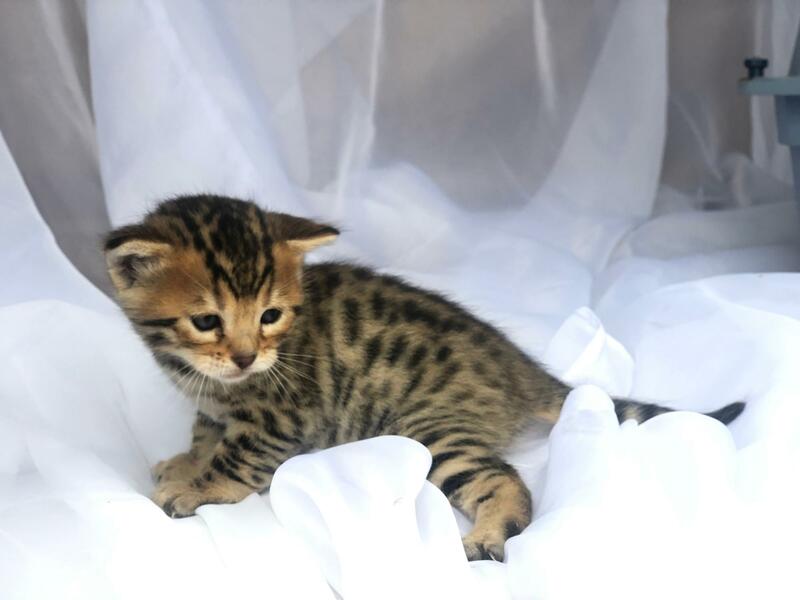 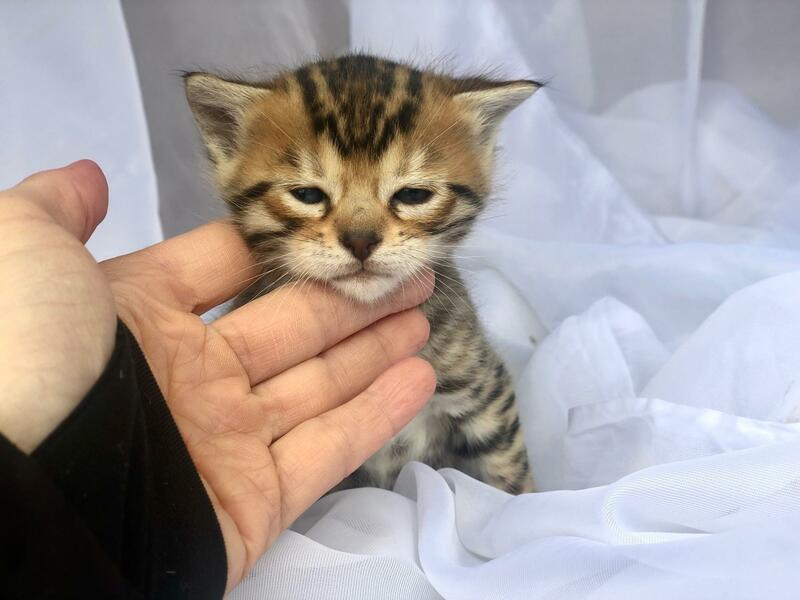 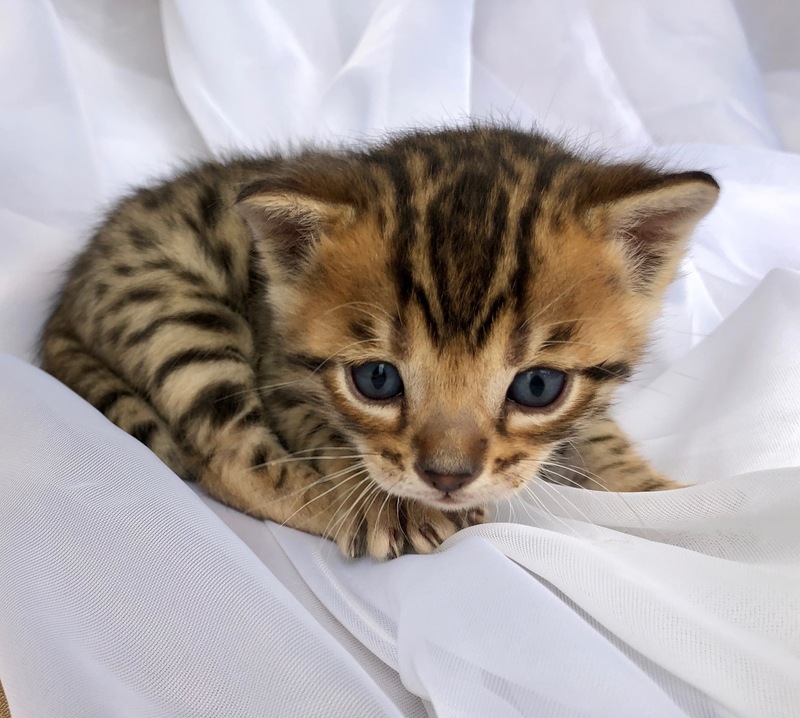 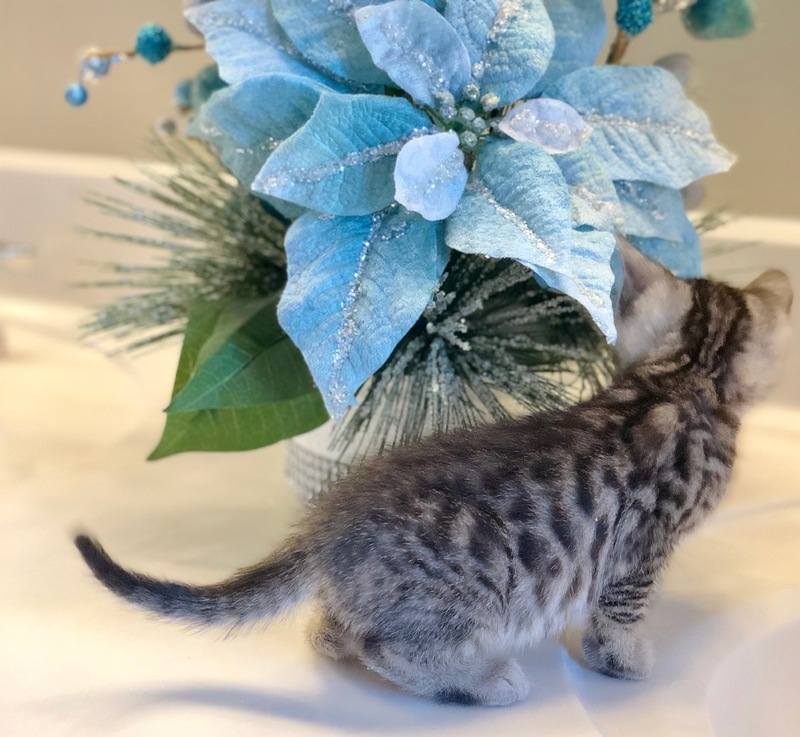 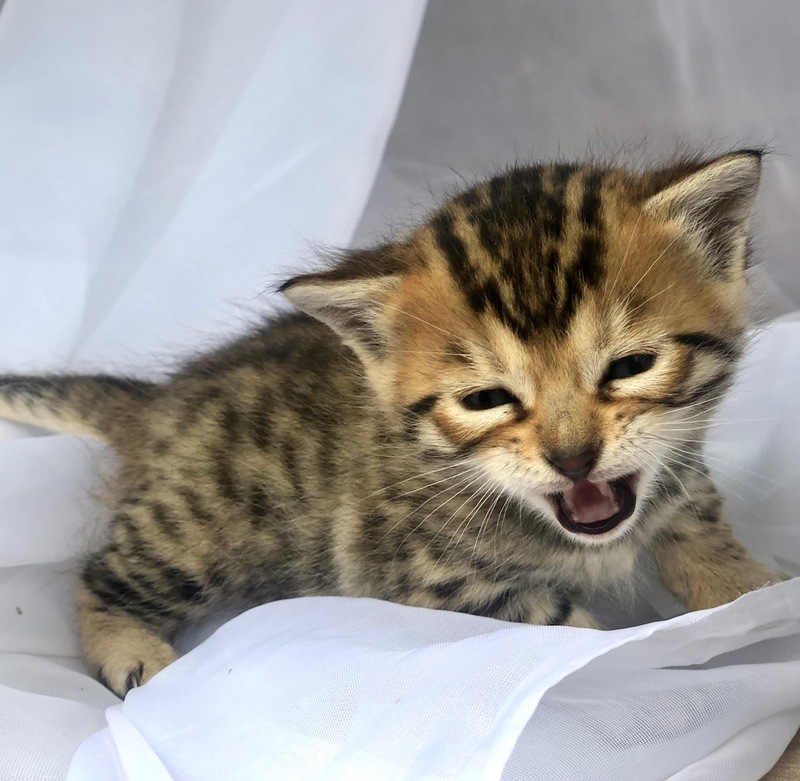 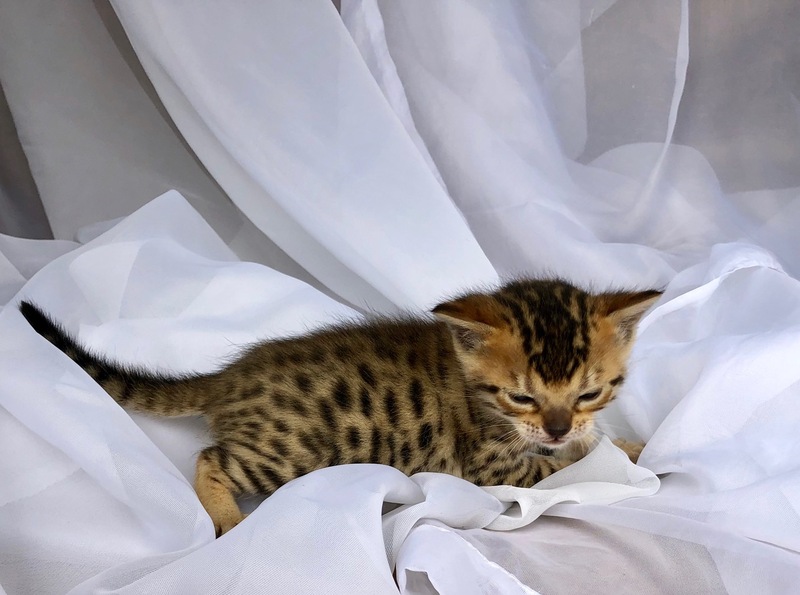 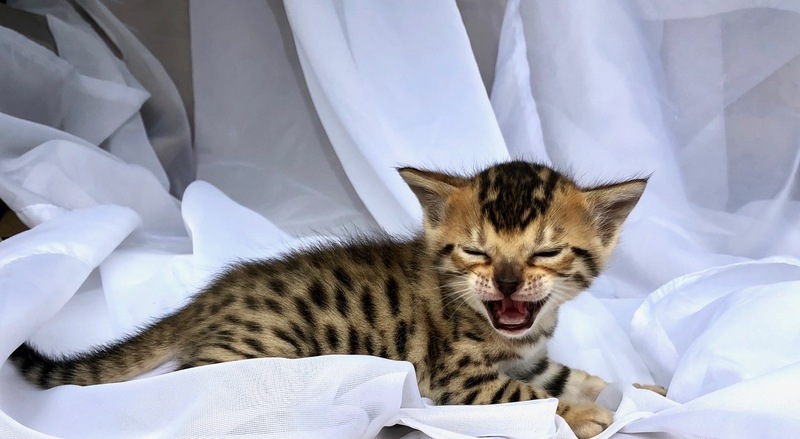 Kitten prices range from $850.00-$1800.00 pet price for SBT bengals and $1000.00 to $6500.00+ for Savannahs. 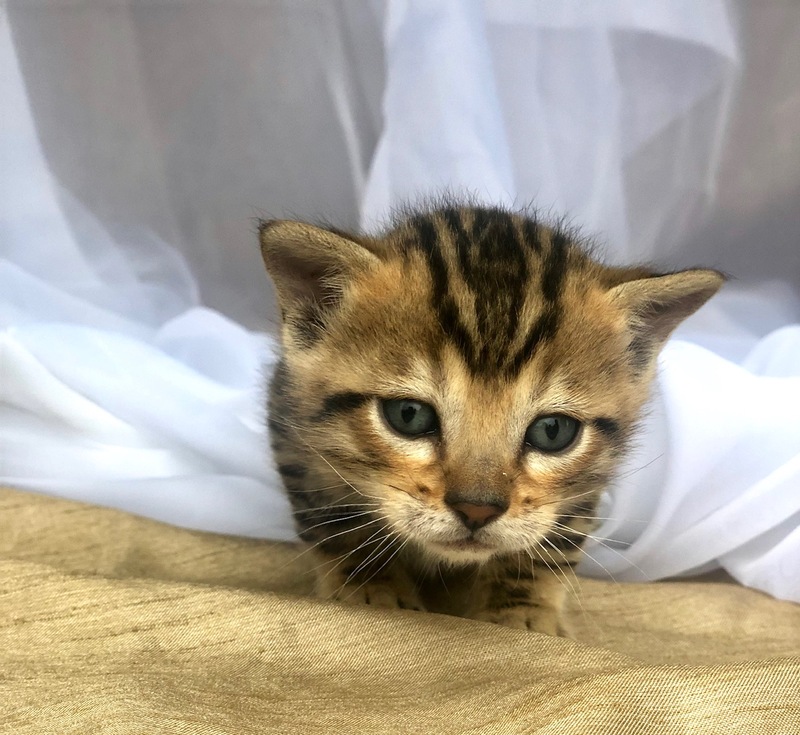 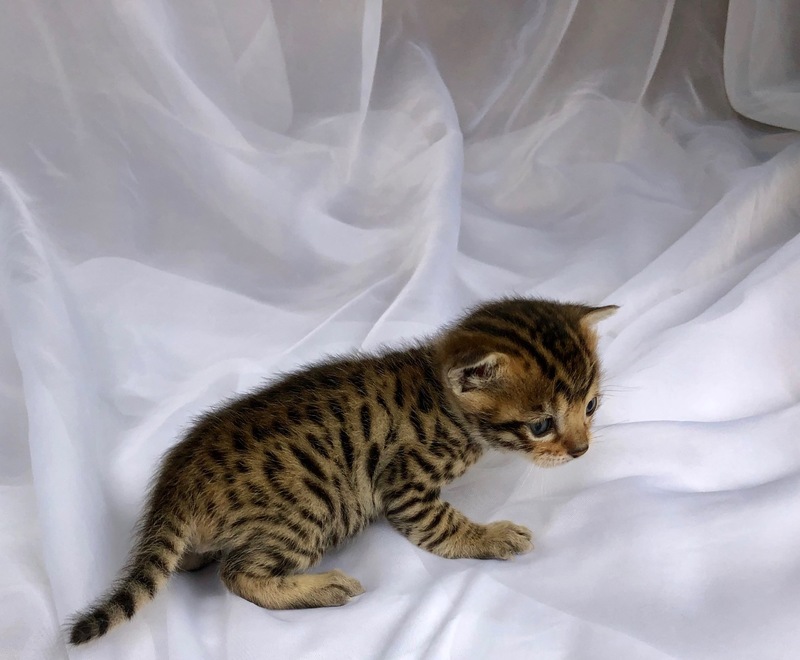 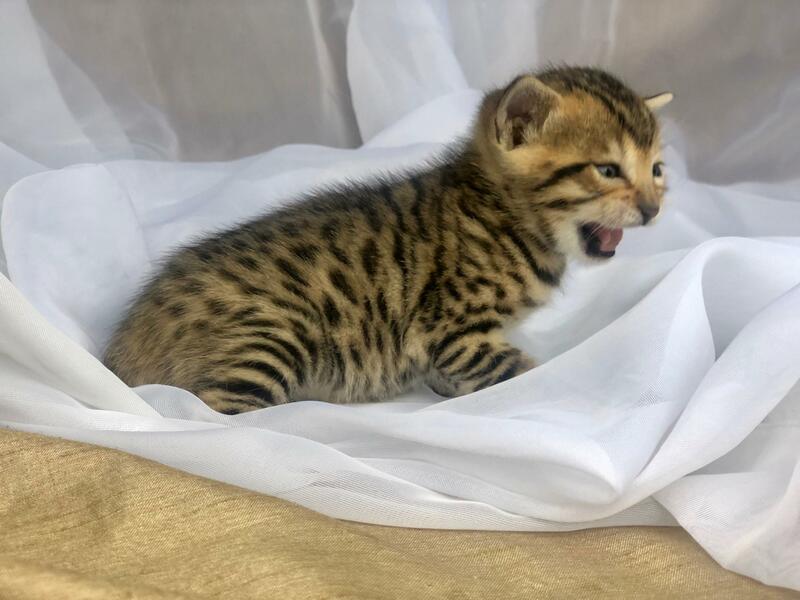 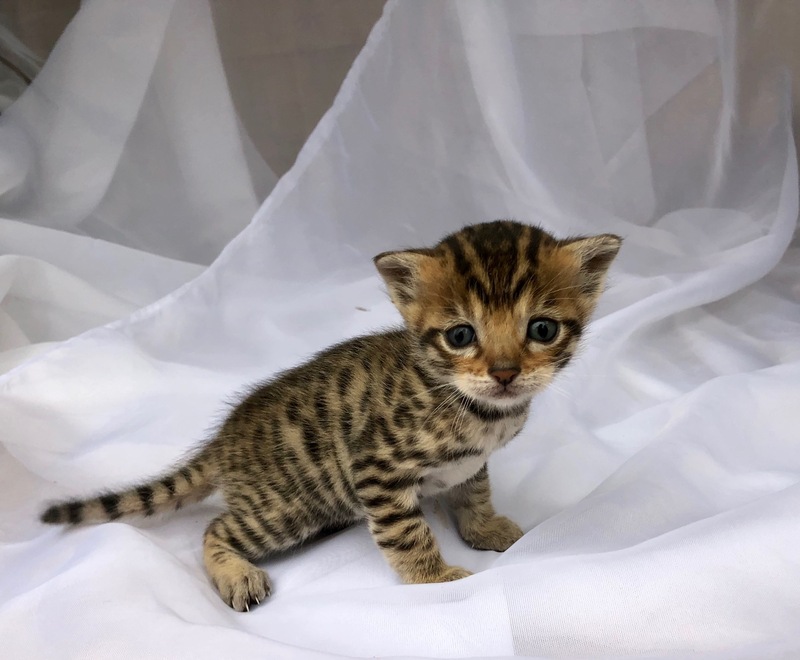 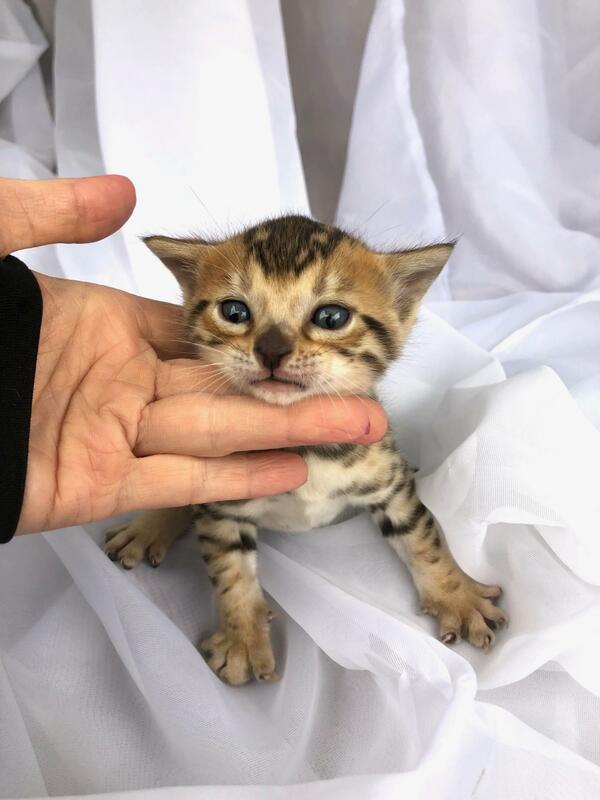 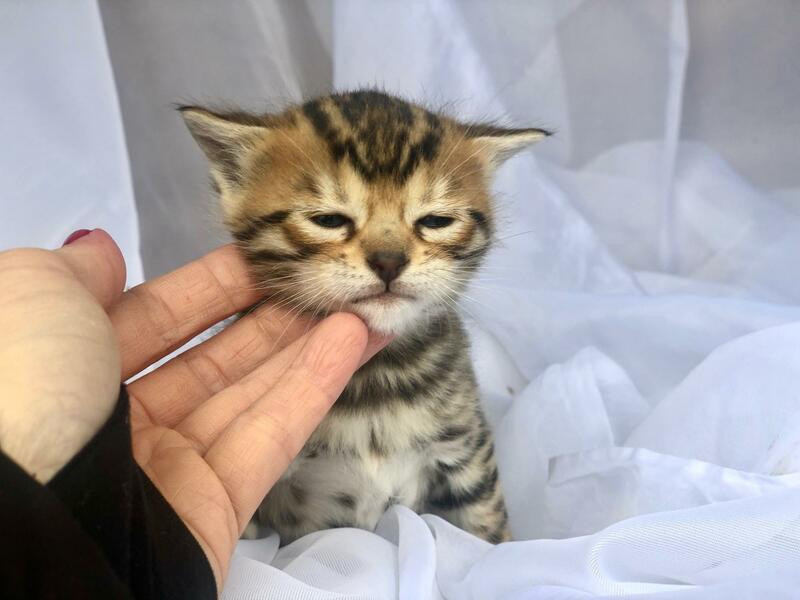 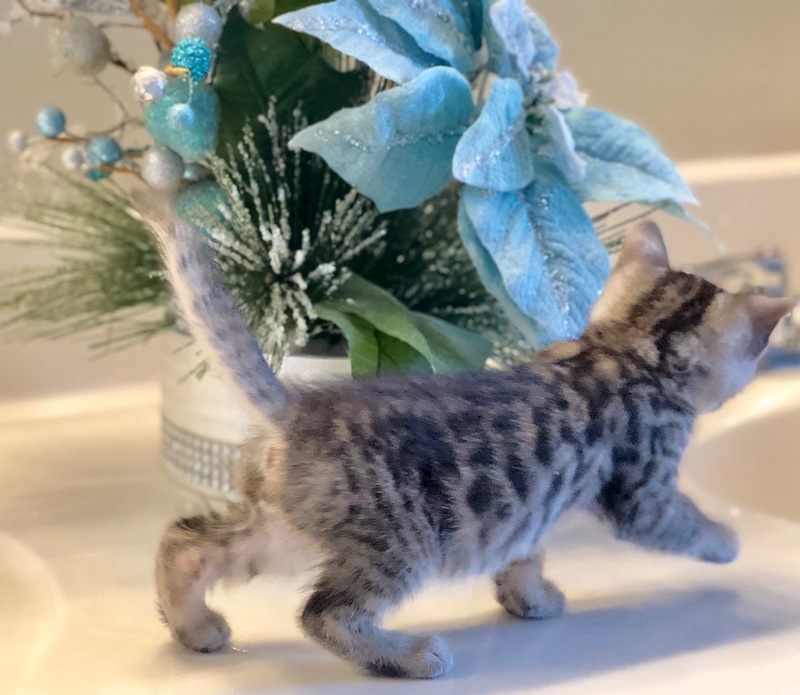 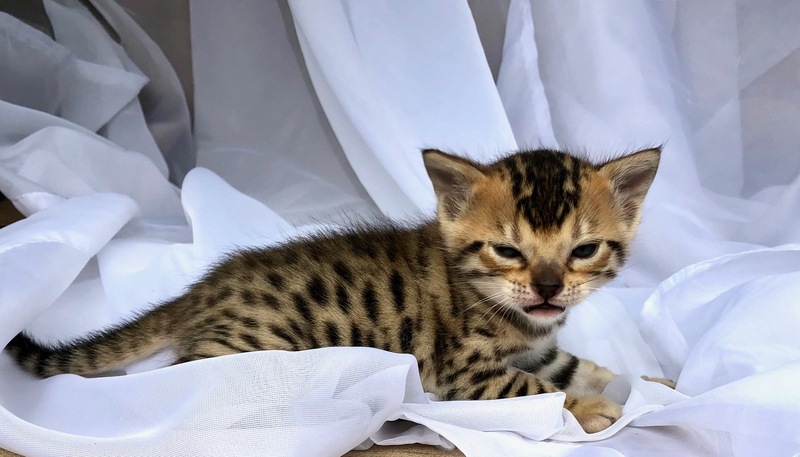 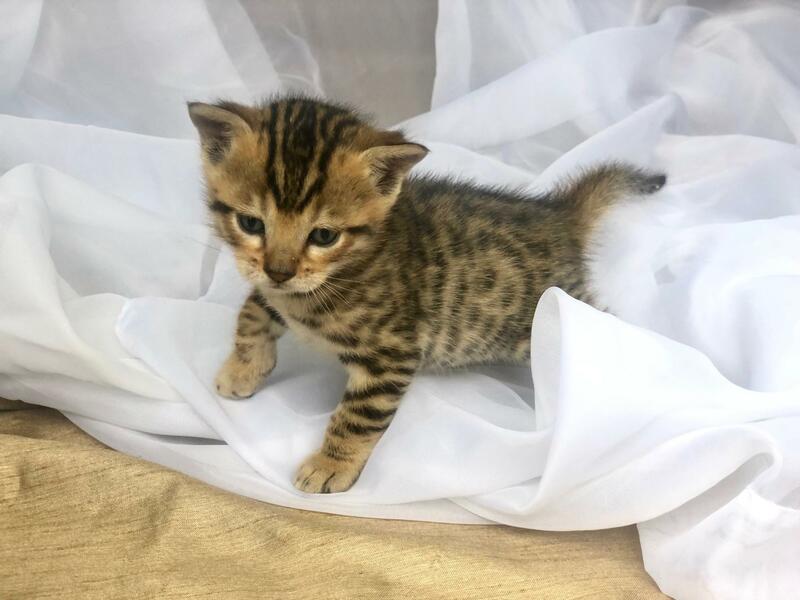 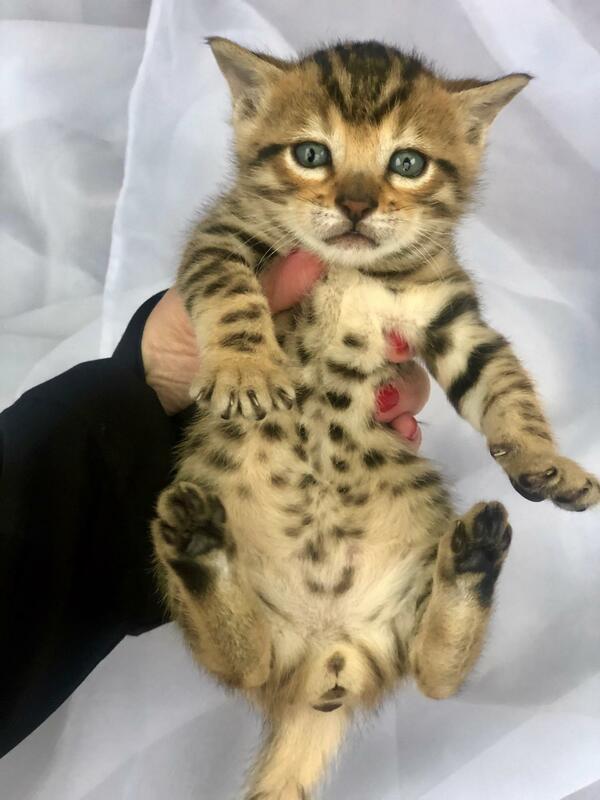 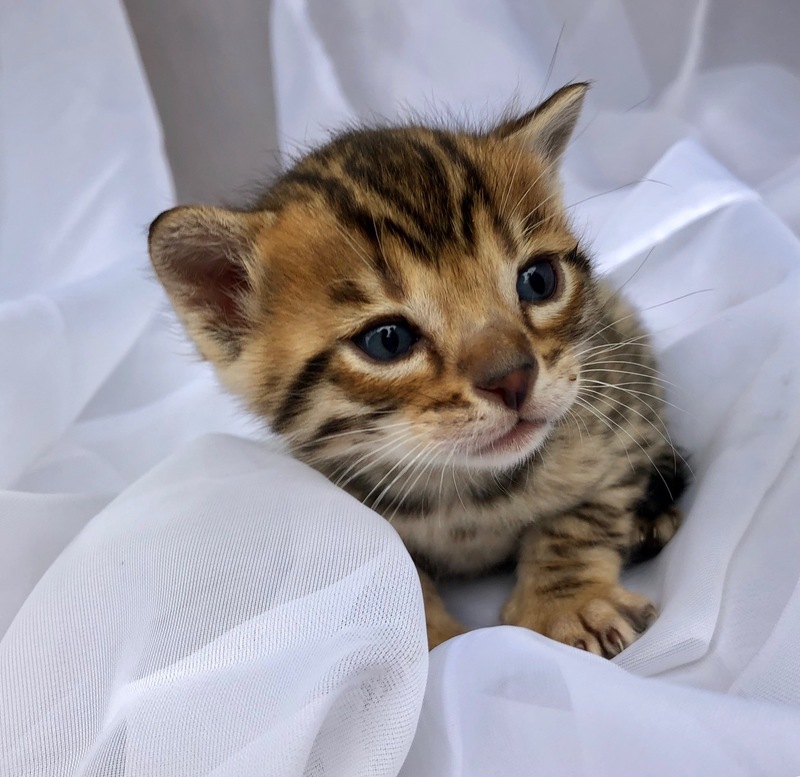 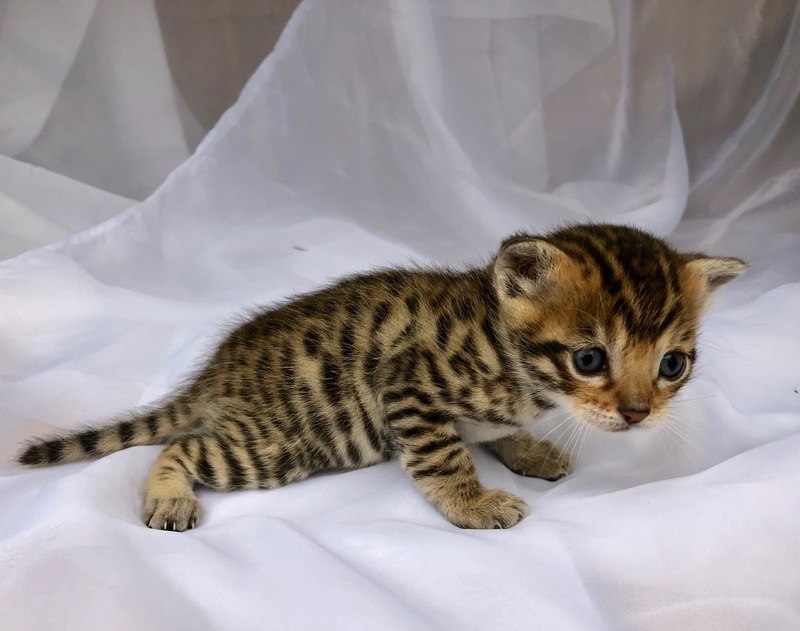 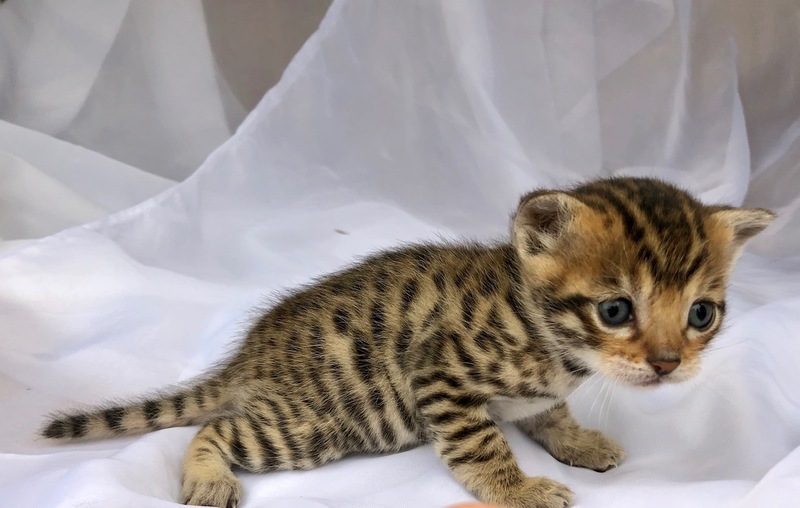 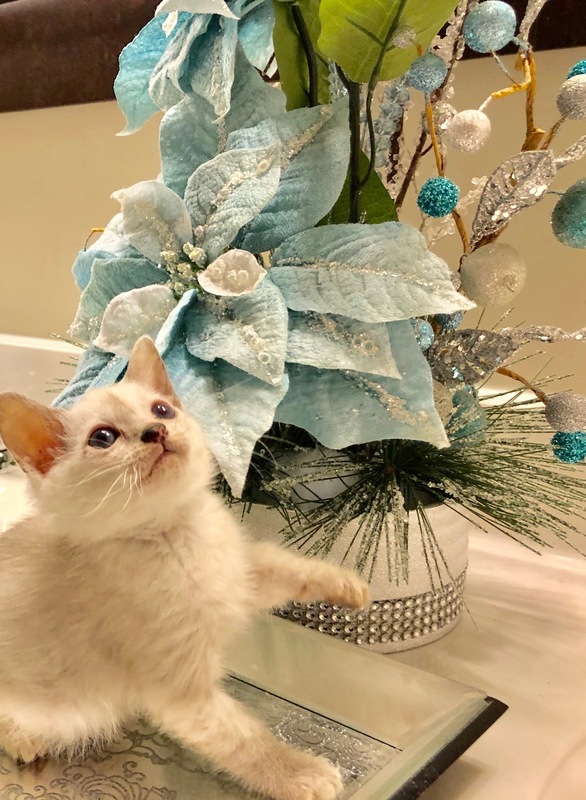 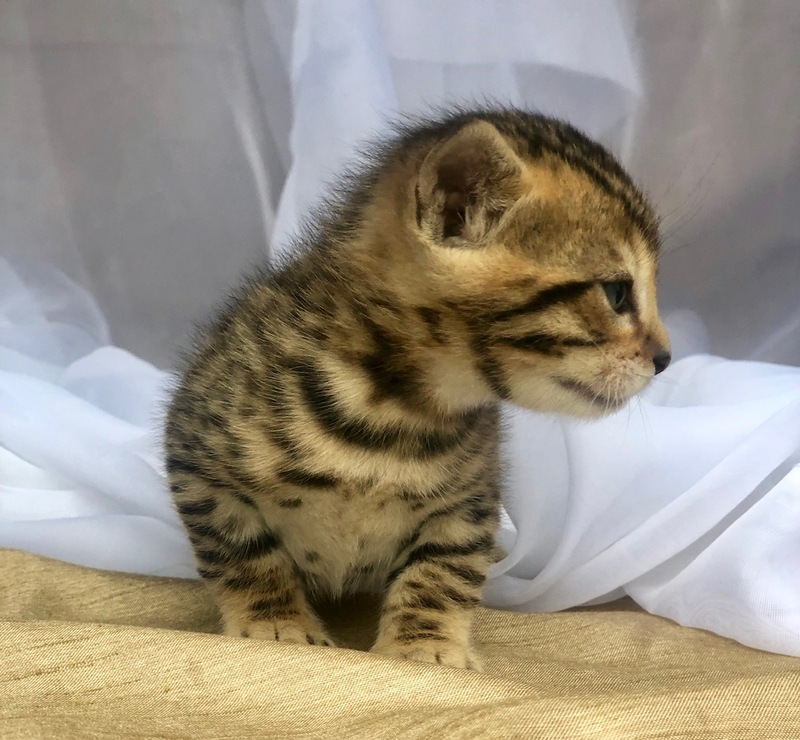 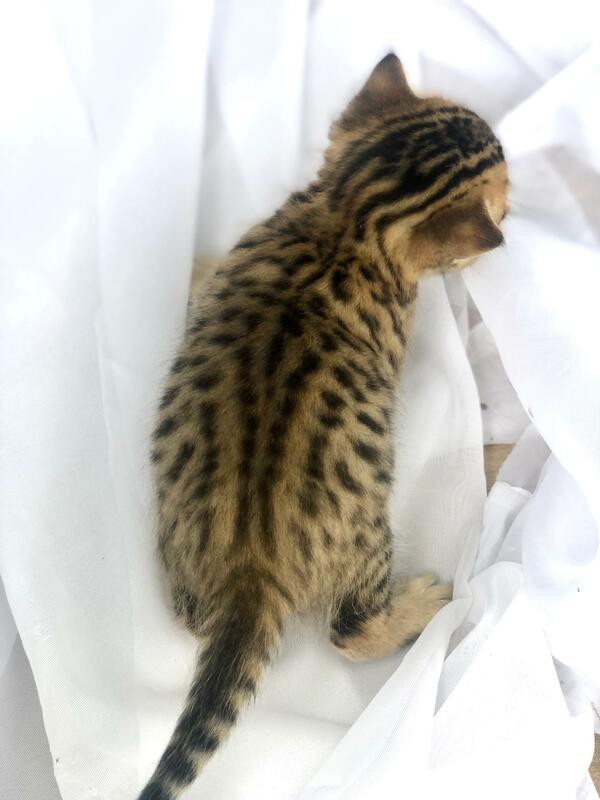 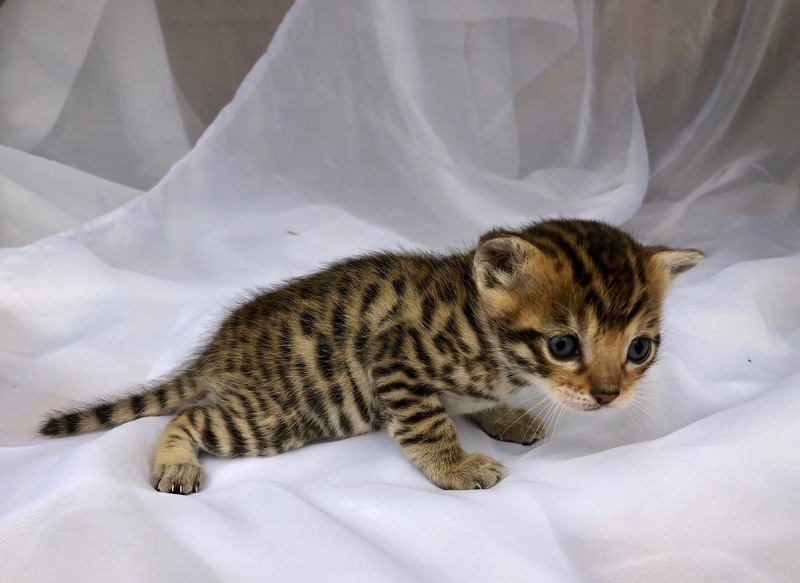 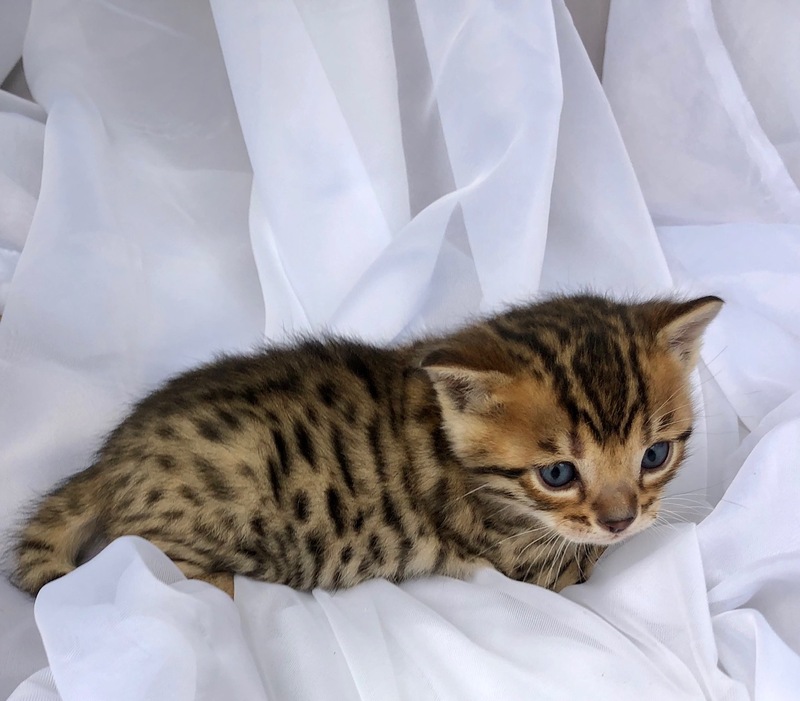 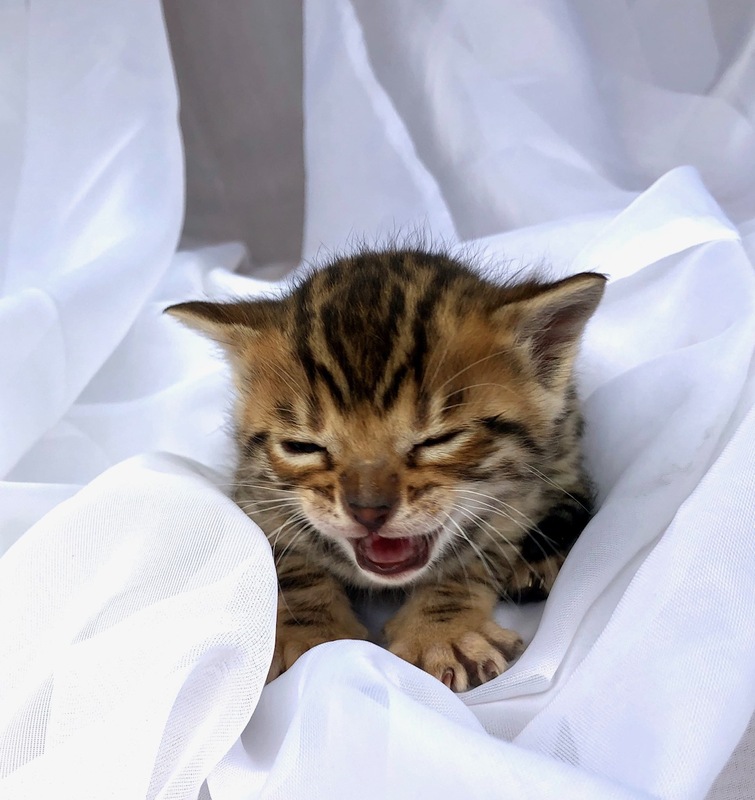 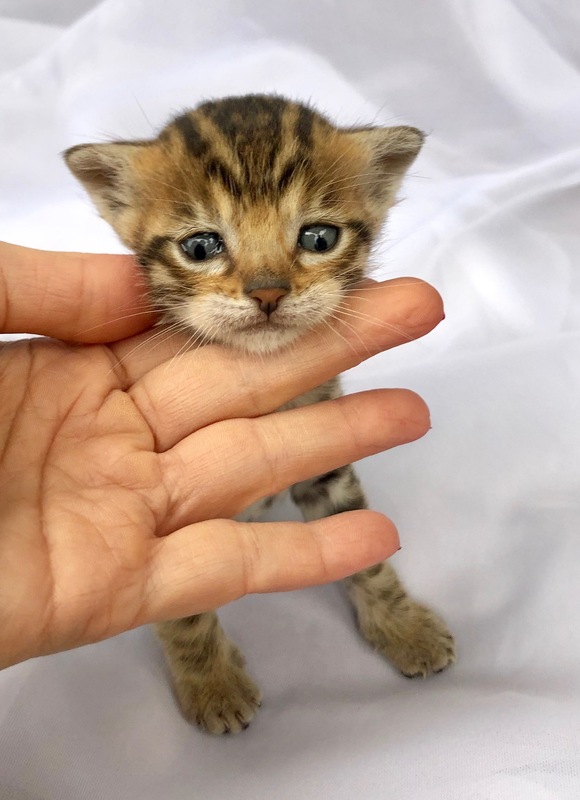 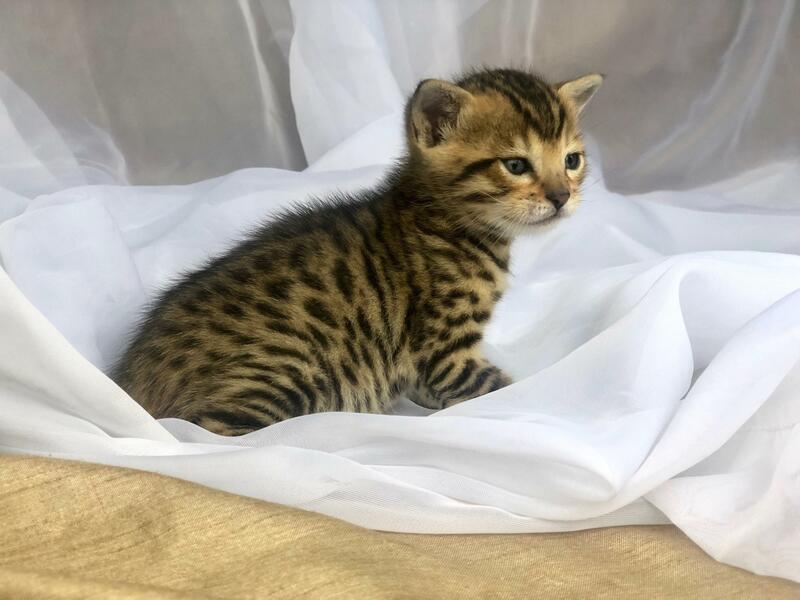 Bengal or Savannah Kittens will be held with a $200.00 non-refundable deposit for SBT's and a 50% deposit for early generation Savannahs. 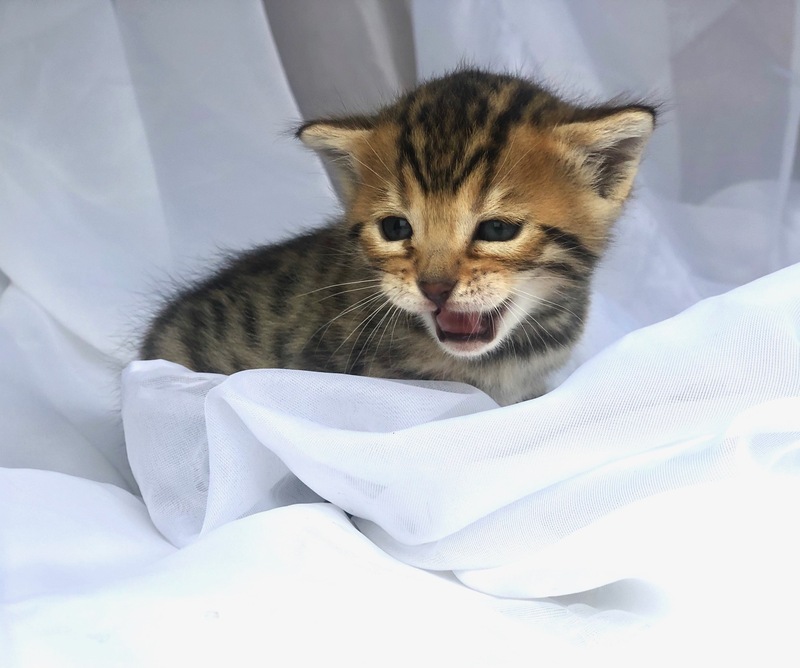 All clients must provide the name of his/her current or potential veterinary clinic. 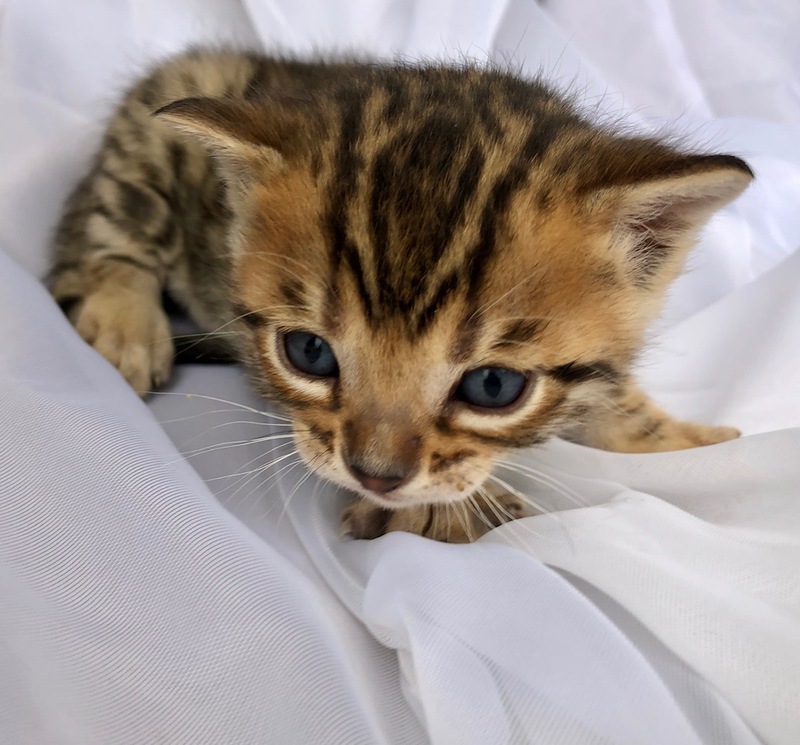 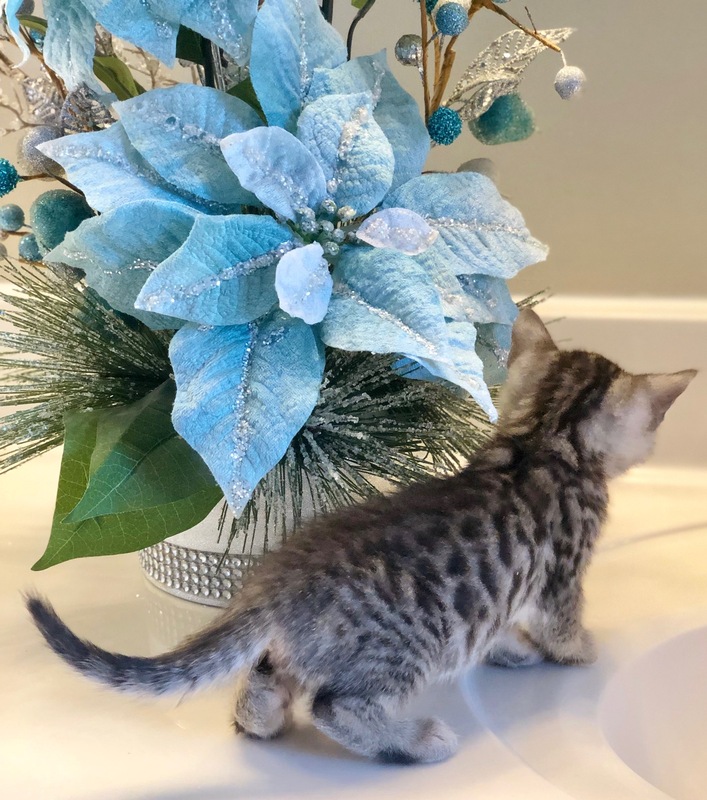 "Peter Cottontail" Brown Spotted male- This little boy is just darling with his poochy whisker pads and big round bengal eyes! 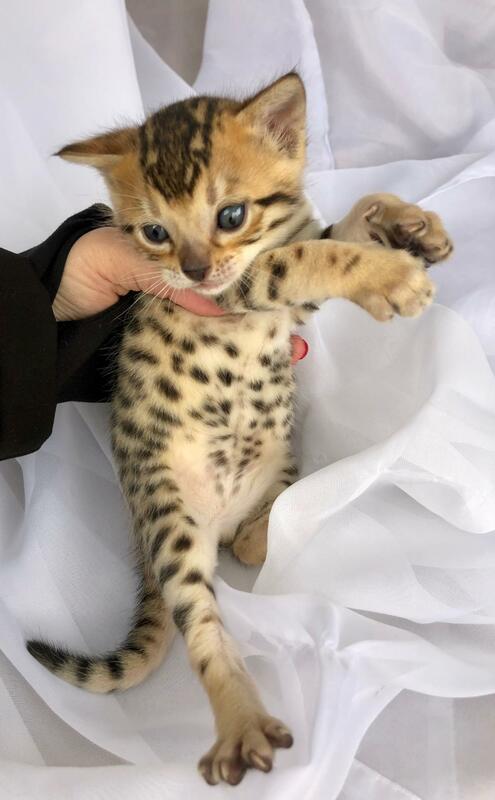 We just love this little guy. 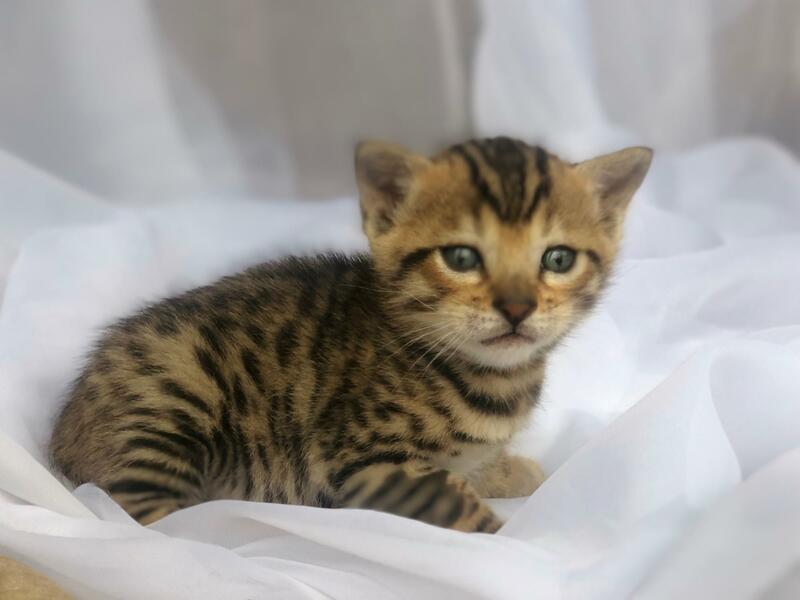 He's all spots, zero rib bars and just has that exotic look. 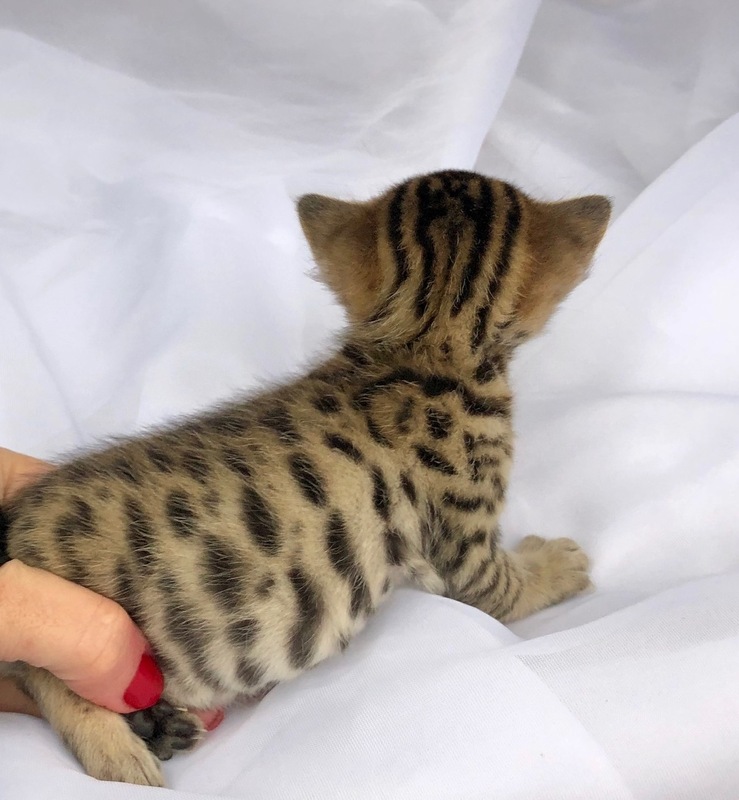 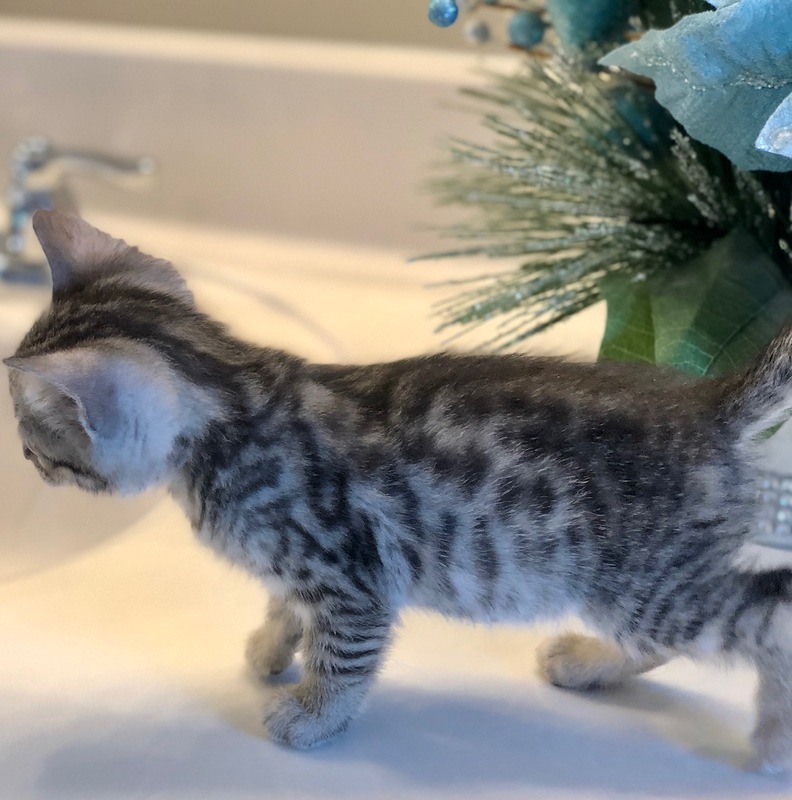 "Sterling" Silver Spotted male- Sterling is going to look a lot like his mommy. 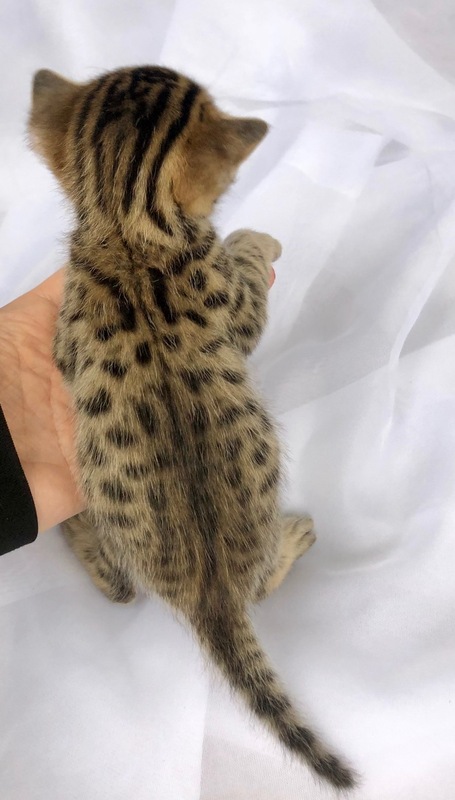 He has nice big spots and great contrast. 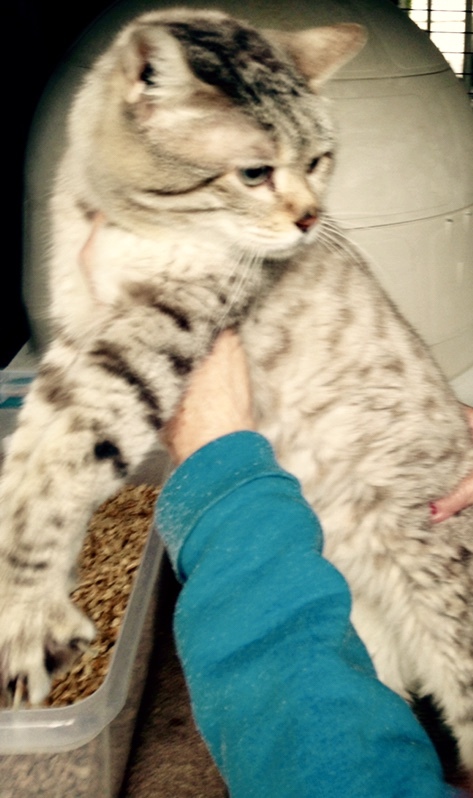 He has zero tarnish and is a nice cool silver with bright whites. 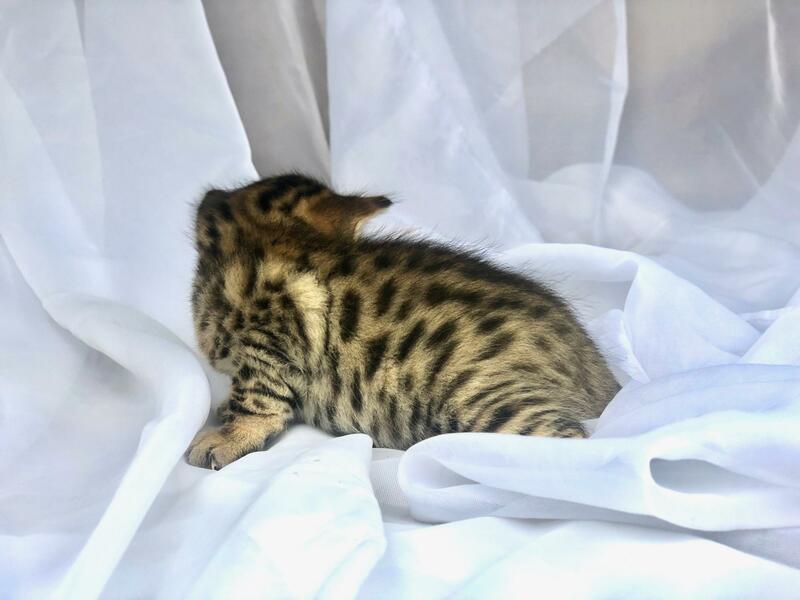 "Candy" Brown Spotted Female- This stunning girl has rich velvety blacks with bright whites and rich warm browns. 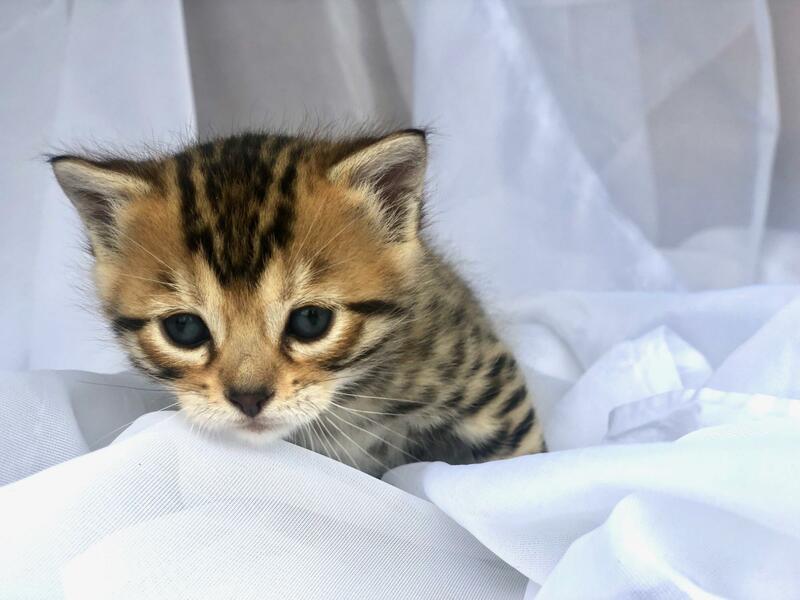 She has a baby doll face and gorgeous spotting. 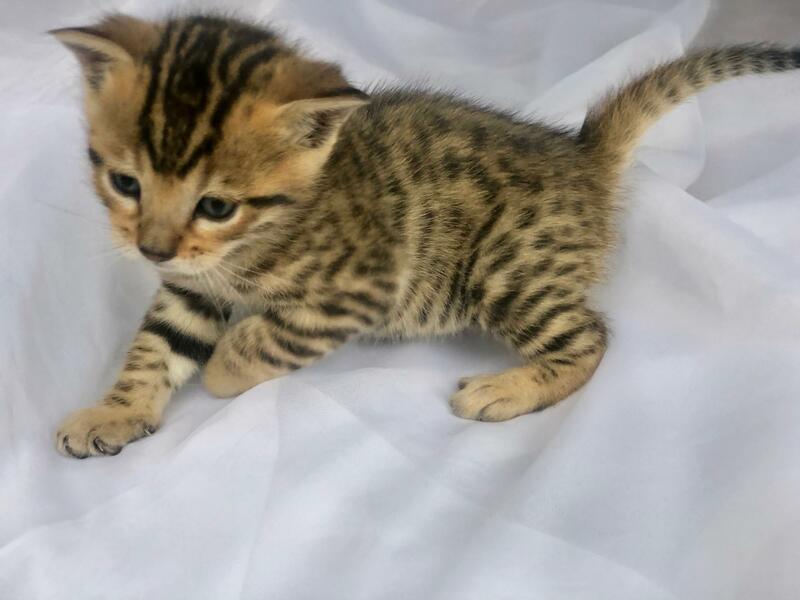 "Peep"- Peep is a warm brown spotted male. 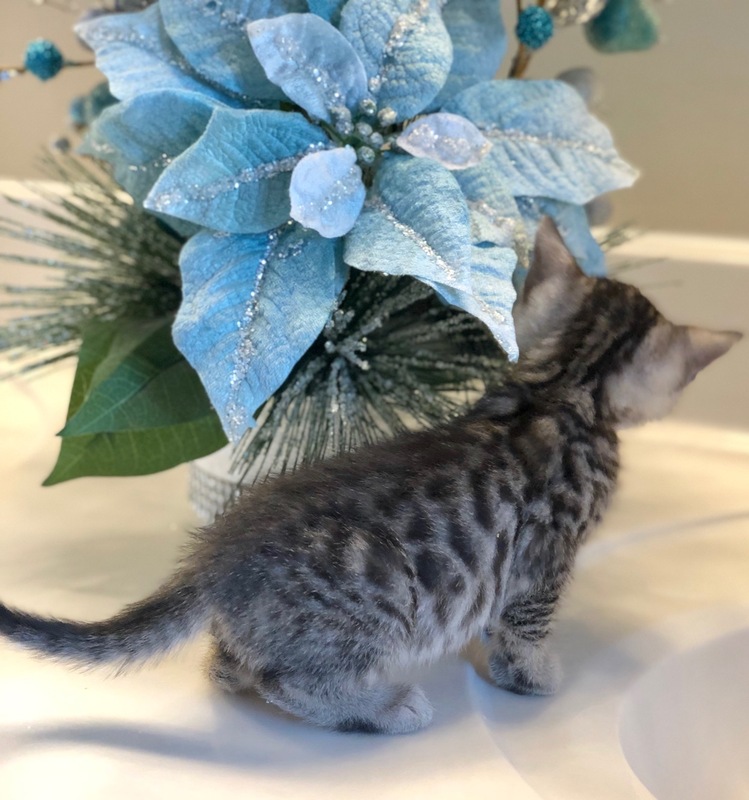 He has a darker nose and he already has some rosetting. 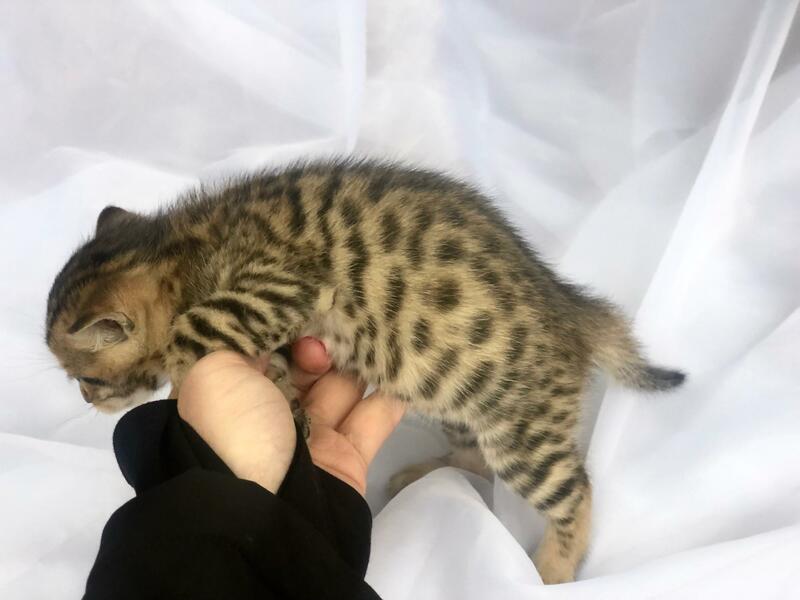 His whisker pads and chin strap and underbelly are all super white and he is loaded with spots! 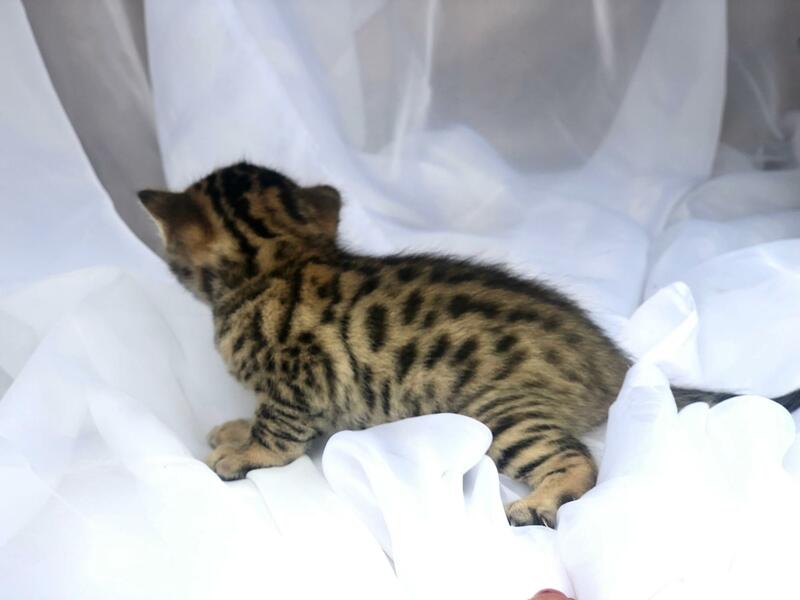 "Easter"- Brown Spotted female. 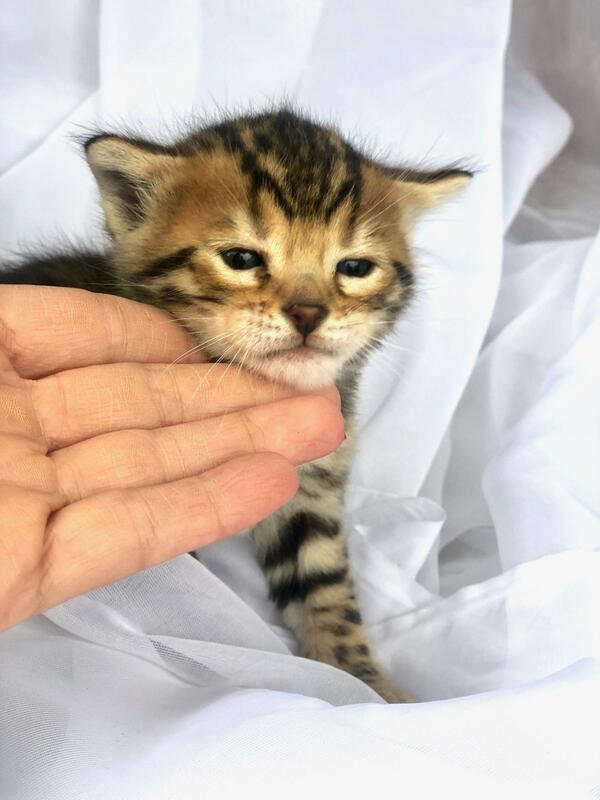 This little girl is a nice heavy kitten. 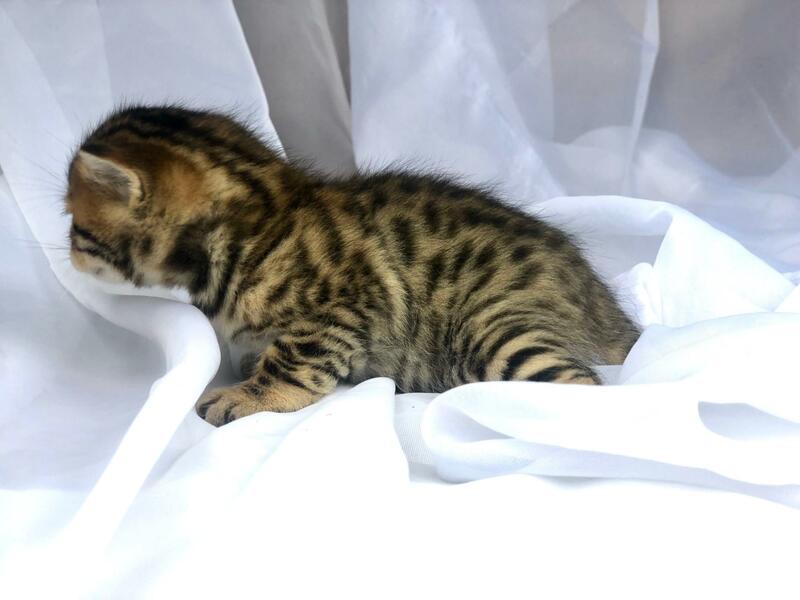 She has rich waarm browns, big dark inky spots, and white prominent whisker pads! 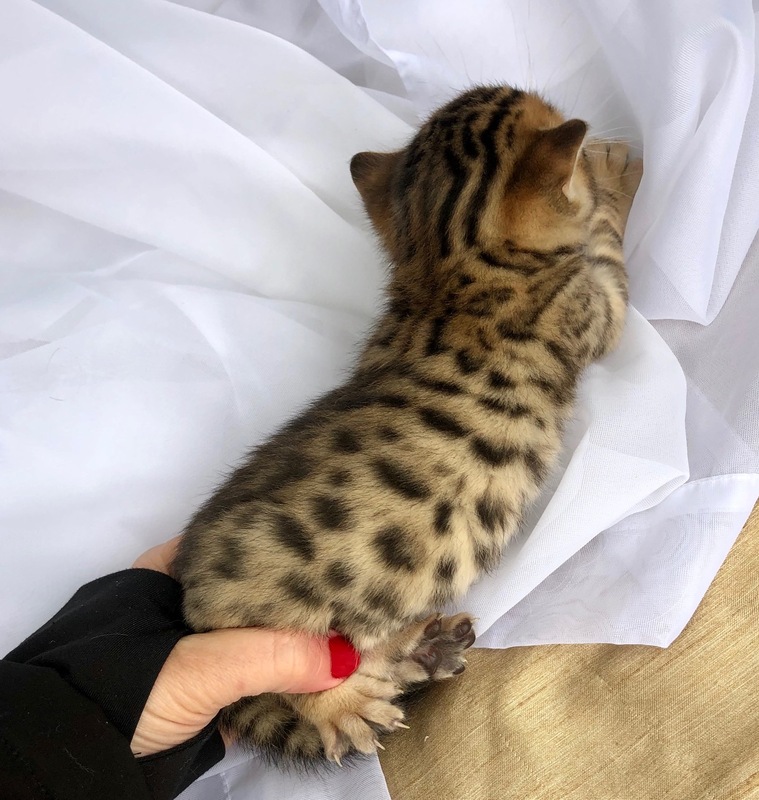 This little gal is going to have some rosetting and be quite the looker! 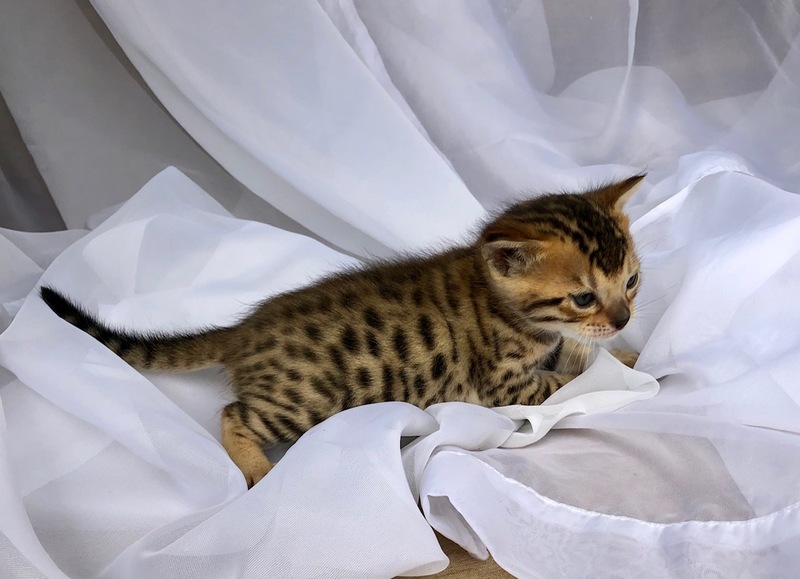 "Richard Parker" Brown Spotted/Rosetted male- This sweet boy comes out of our original bloodlines and has a gorgeous whited chin strap and underbelly with dark inky spots. 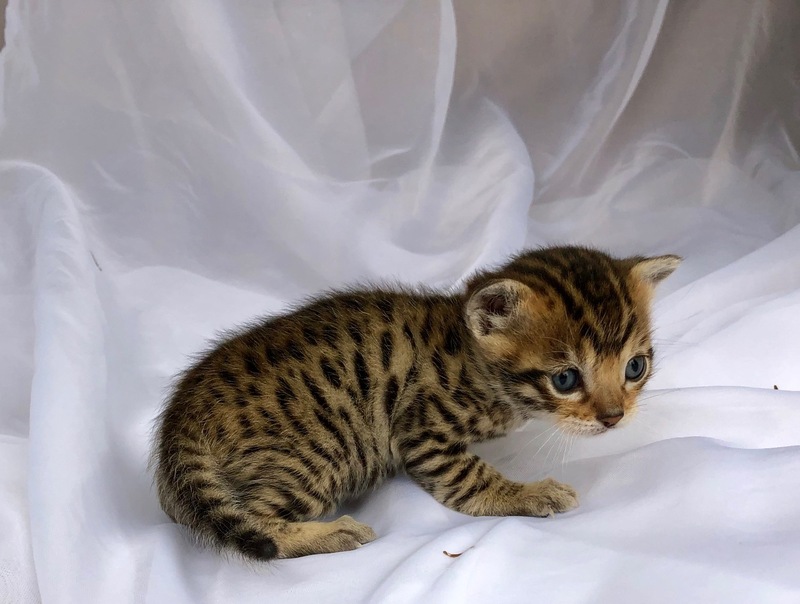 He is a warmer brown and will have some rosetting like his mommy. 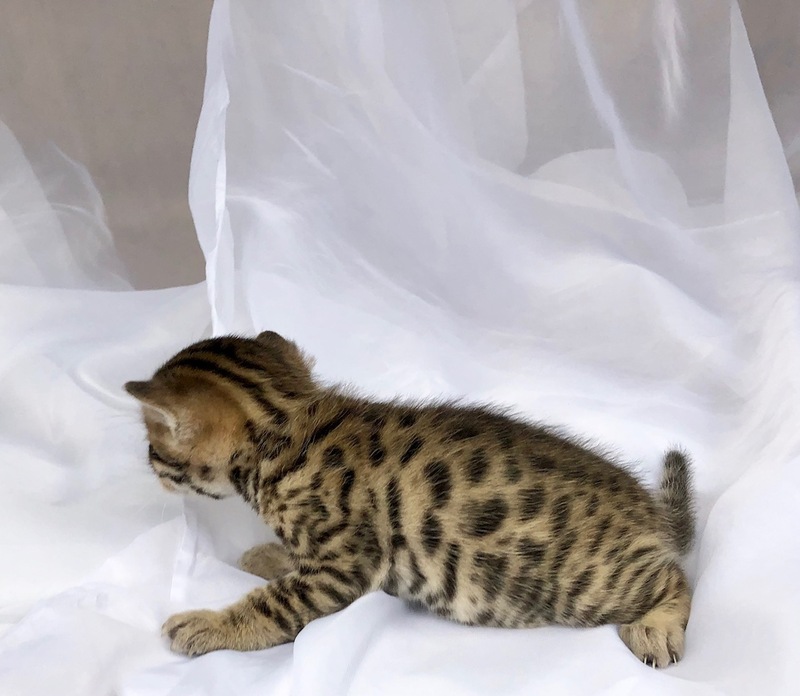 "Jelly Bean" Brown Spotted Female- This stunning girl is a show stopper! 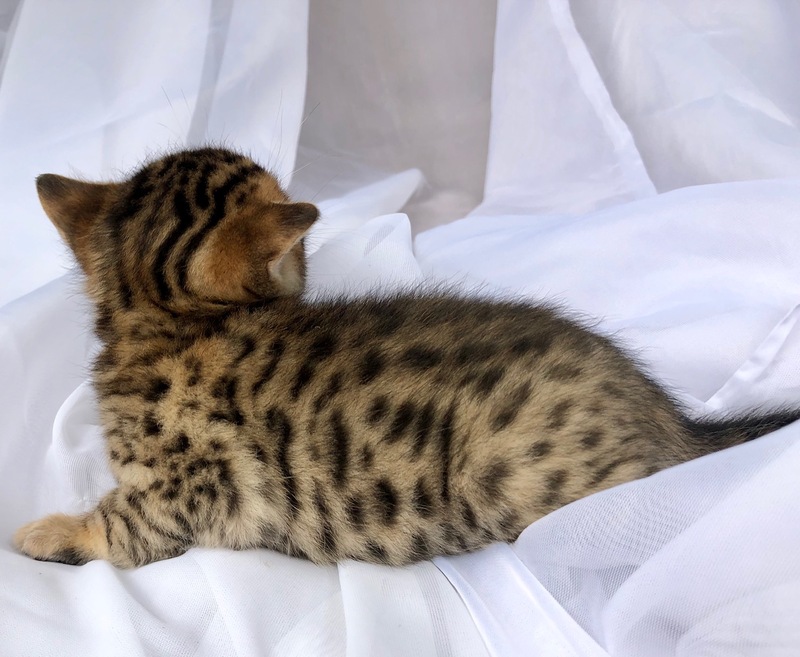 She has gorgeous bright whites and her spots are nice and inky black. 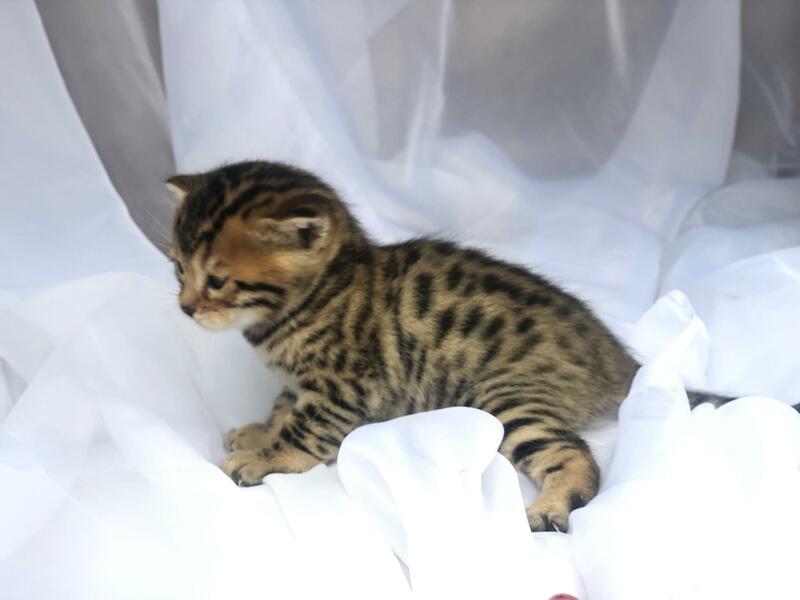 She has warm, rich browns and the highly desirable dark nose with a whited underbelly and chin strap.